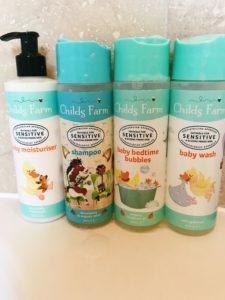 Have you recently had a baby? Congratulations! 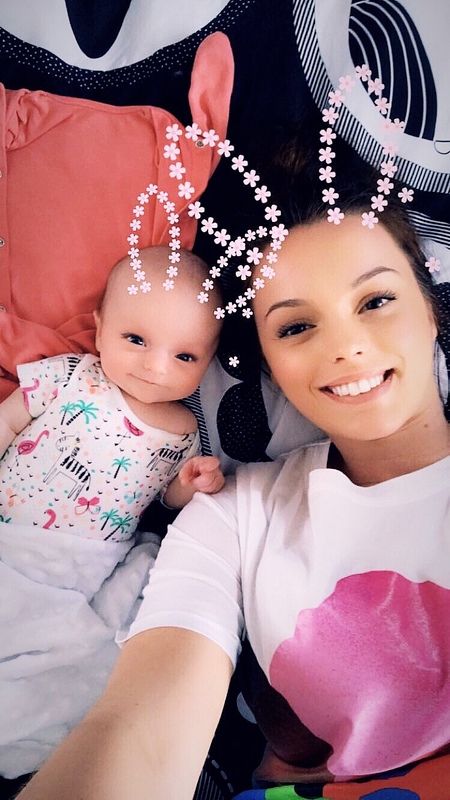 I’ve just had a baby too, well 5 months ago now and I can finally say I have started to get the hang of motherhood now and I honestly never thought I would ever be able to say that. Especially in the first 3 months. That was the hardest for me. 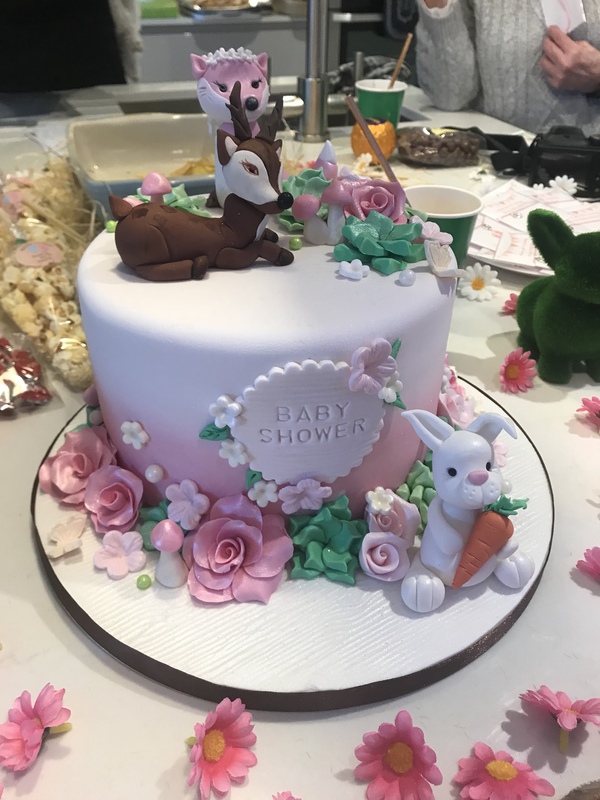 I attended one of my friends baby shower the other day and she had an “Advice Book” for guests to leave a piece of advice in their about motherhood. Considering I have just been in the baby bubble recently my mind went blank. It reminded me, really clearly, about the new mum wilderness and the wasteland of parenting advice I received. And the thing is, most of it is terrible. But when you are a first time mum it’s difficult to tell. You just want to be a sponge and absorb everything you are told so you can try to do a perfect job. 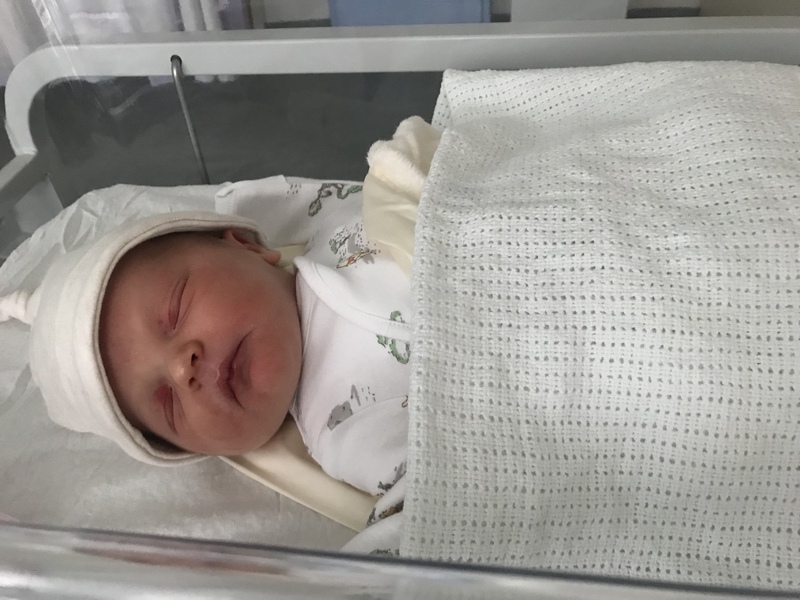 What is the worst advice you could give to new mums? How many people have been told this? I still get told this 5 months on :O . It’s like its everybody’s favourite piece of advice to give you. They put their hand on your arm and tilt their head whist saying it in a calm yet patronising tone. Well these people must not have had a baby in a very long time because it is not that easy. I tried. 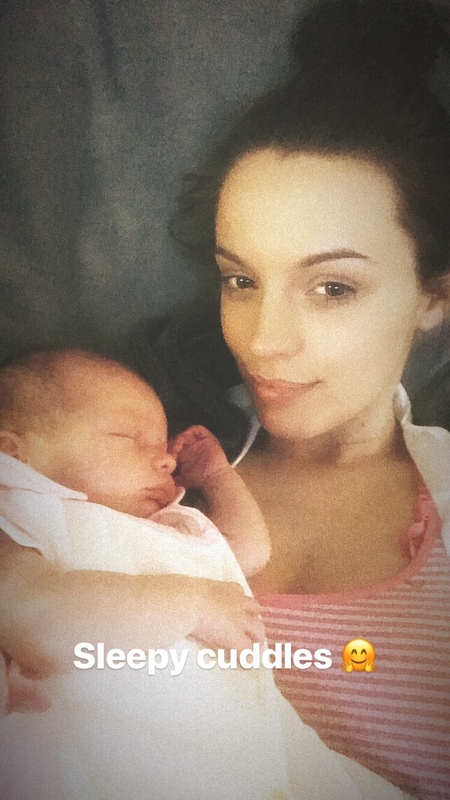 In reality when your baby naps that is the only time you get to do anything such as have a shower, eat, clean, you know, basic human needs. By the time you fall asleep for your own nap your baby will wake up again anyway. Literally no point. Erm no. No the cleaning can not wait. I refuse to live in a pig sty. It’s bad enough being horrendously tired with a million and one visitors to see the baby and your house being a tip. For me, a messy house made it look like a sign I was not coping. In my house if I didn’t do the cleaning then no one else was exactly going to do it so what are you suppose to do? leave the dirty pots to pile up in the sink and not wash any clothes that are covered in baby sick and you know what else? Disclaimer: If you do have someone to do the cleaning for you then totally take up the offer and yes the cleaning can wait 🙂 Put your feet up and enjoy every moment. Well 99% of the advice I have received from Health Visitors has been a waste of time. I’m sure there are lovely health visitors out there but personally I am yet to come across one. Stupid questions like “Are you sleeping okay?” “Erm well no obviously I have just had a newborn baby”. “You must get some sleep” brilliant, great advice thank you. Or speaking to them about reflux and needing Mole to be sat upright was like waving a red flag at a bull. “Oh no you can’t keep a newborn upright, they have to be lay flat.” You can’t have this or that etc you get my point. I use Google for everything. 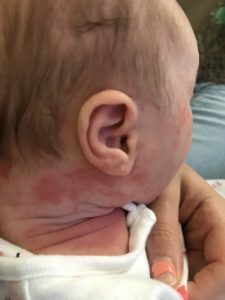 I would Google every single symptom Mole had, I’d Google “Why is my baby not sleeping?” or “What is this mark on her?” I would stay on Google for hours scanning every single page looking for the answer. If you are doing this at 3am and you are on page 17 of Google search results I think you should stop. After trying this piece fo advice I do not know who was left more traumatised me or Mole. This advice has been great for other parents I believe but not so great for me. Mole cries if she needs something or she is genuinely upset about something and leaving her to cry made matters worse. I don’t want to see my baby upset or hear her cry. I’d rather just see to her problem and then get on with making her feel better. So there you have it. My bad parenting advice! Comment below what bad parenting advice you received! 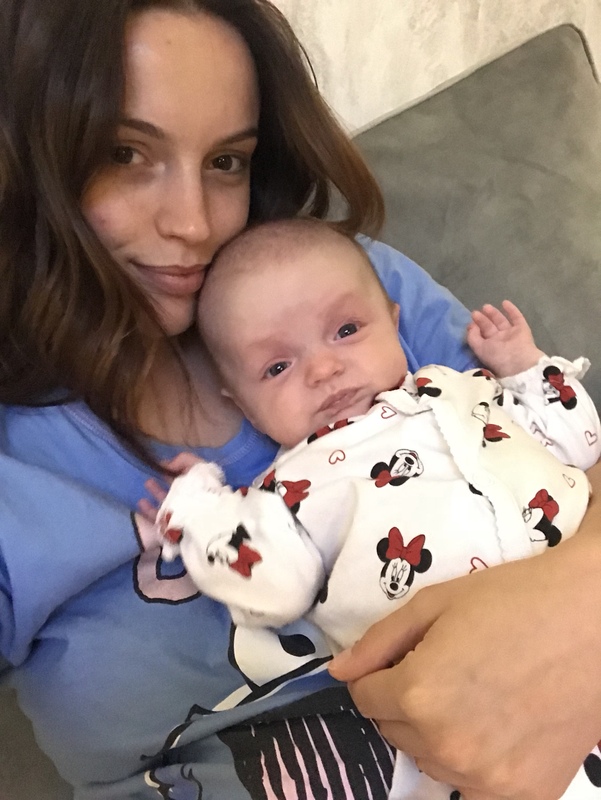 No I am definitely not broody…well don’t ask me that question if I am around cute, little newborns or Mole is having a good day. But… I was thinking about what I would do differently next time I have a baby. I wonder if you also would do the same or have experienced the same feelings as me? 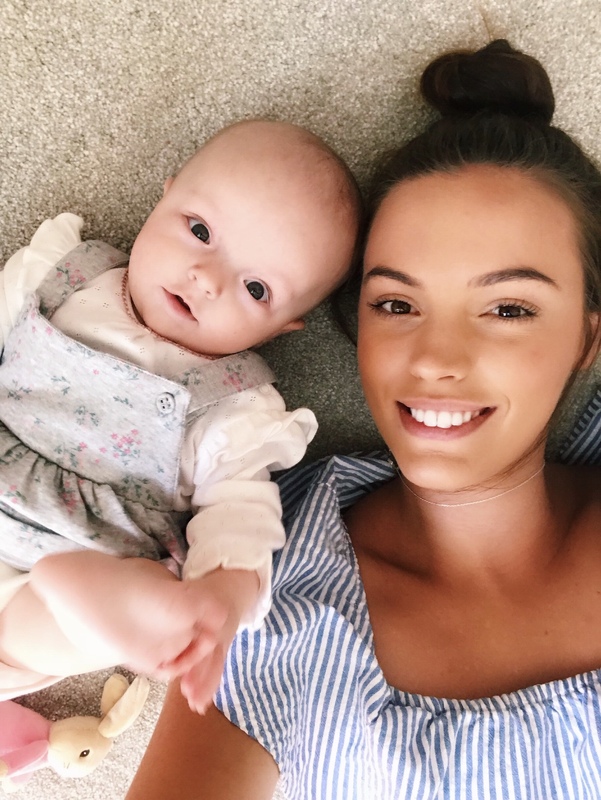 This post will also be helpful for a new mum-to-be, getting some advice from a mum that had no clue at first and has learnt a lot from her mistakes! Now I know I am only at number 1 and already doing this wrong as I did have my mum present during labour with Mole, but, I’d 100% make sure she was again. There is just something calming about having your mother there. Maybe it is because she has been through it before and can give you advice or maybe its helpful because everyone needs their mummy sometimes. Comment below if you had any parents present? Sure I will give it a go, just like I did with Mole and if it doesn’t work out I promise myself not to lose sleep over it. Mole has coped just fine on formula and it has been very easy with bottle feeding and working out a routine. 3. Get sleep before visitors! This is a huge one for me. 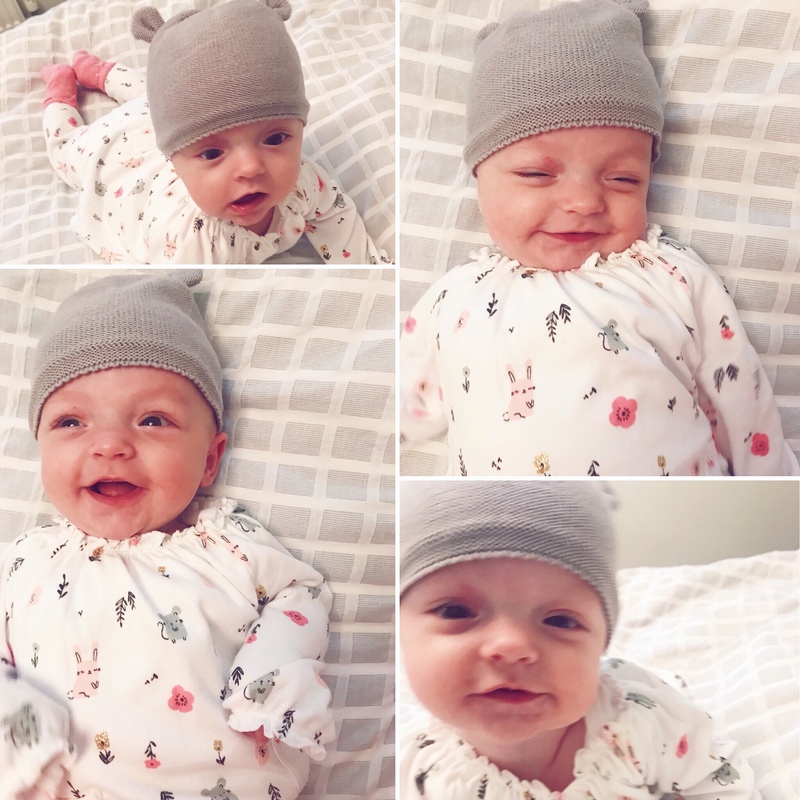 As soon as you have a new baby you are in a whirlwind and surviving off adrenaline and coffee. 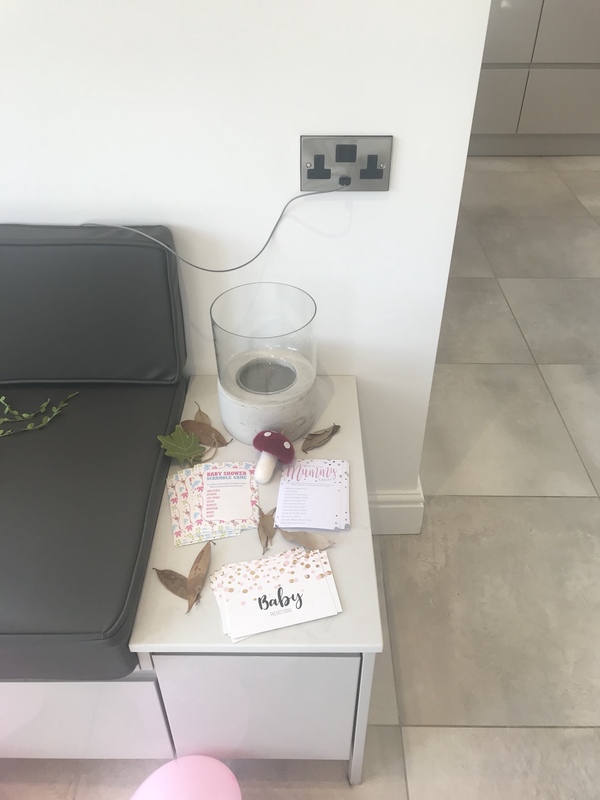 I am so grateful for all visitors, taking time out of their lives to see my baby and making sure we are all well, but, it completely floored me. I think next time I will wait a week before allowing visitors so I can get settled…or I will make them make their own drinks so I don’t have to keep getting up and going through the pain of my burning stitches sitting back down. Sorry not sorry. I am so guilty of always painting a smile on my face and pretending i’m all good and next time I will not allow myself to do this. Its far too draining. I will be honest and ask for help when I need it and not try to cope on my own. Some advice is definitely helpful however, I tried to take on board everyone’s advice and it didn’t work for me. I will learn as I go and make my own mistakes to learn from. Next time I will be more confident to trust my own instinct. This includes getting into my own routine and not follow someone else’s. I have no photographs of Mole right after I gave birth to her. I have some from a while later but I would love to see more from right when she came into the world. I think it would be incredible to see. When I was pregnant I had the whole room finished as I felt an urge to rush it all. When in reality the baby doesn’t even sleep in there for 6 months. 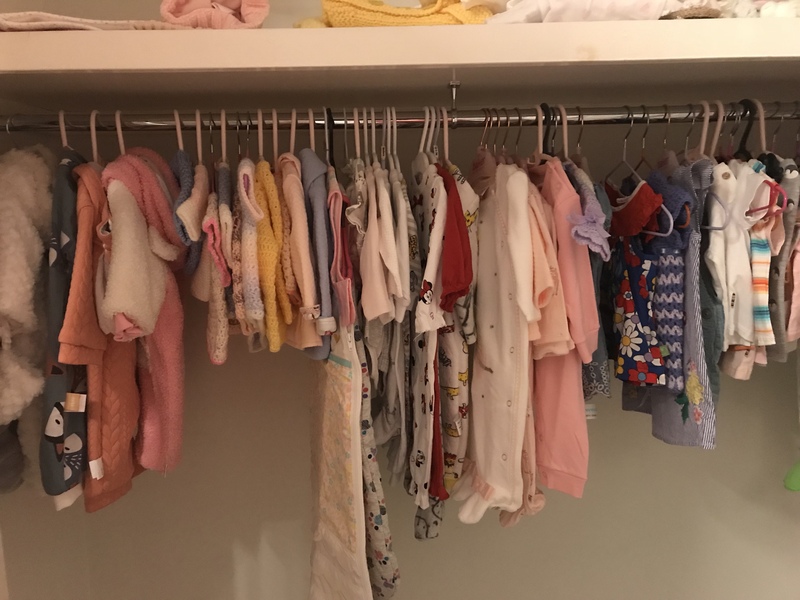 I wish I took the time to plan out the nursery and not jump straight into the first style I had in mind. I was told not to use a dummy because it can confuse the baby when they come to breastfeed. 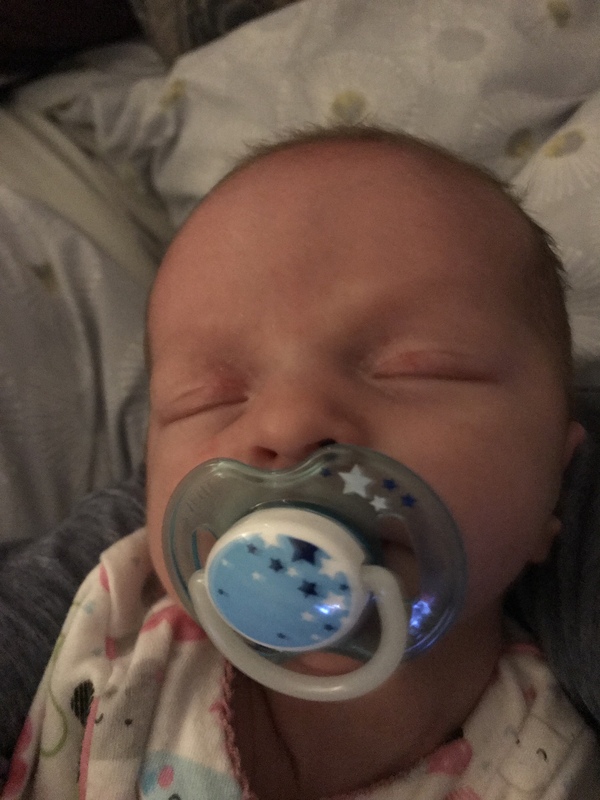 Mole loves her dummy as a comforter and it has saved us in so many situations where she has got herself worked up and the dummy has helped to calm her down. I wish I would have gave it to her sooner and saved some public meltdowns. 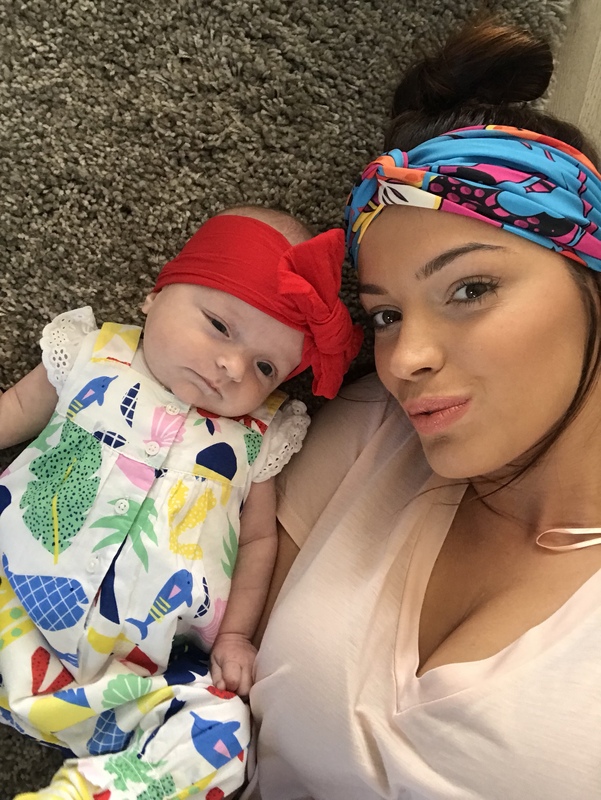 Next time around I’m going to try and put more money behind me so I can have longer off work and really cherish the moment of being able to spend it with raising my baby. I hate the fact that money controls how much time I will have off with Mole. I’d love to have longer as it is going by far too quickly now. 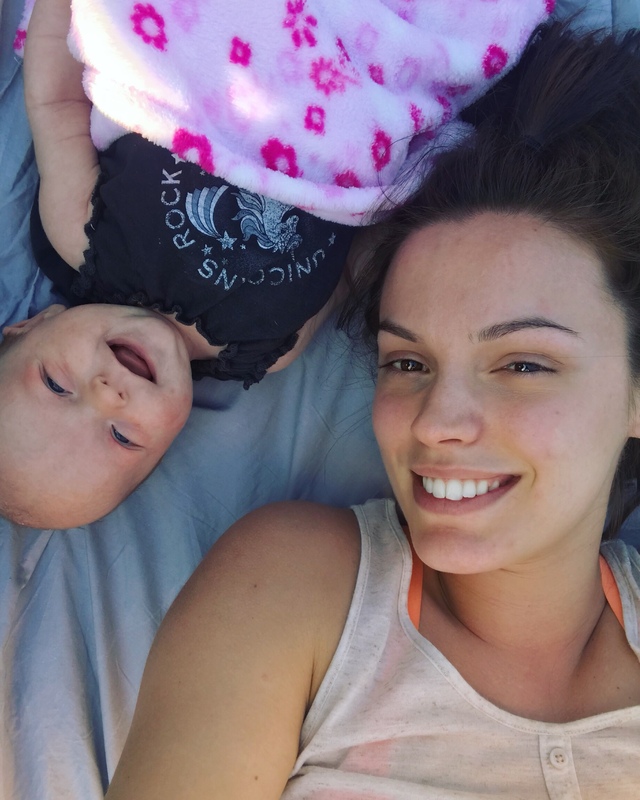 I went to the gym just 2 weeks after giving birth. I was so disgusted with how I looked and I would slog myself at the gym to try and feel like the old me again. Although I have controlled what I eat to an extent and I have been active, your body does just go back over time. I will not go crazy trying to fit into my old jeans until I am truly ready and after more sleep. I was super chilled through out my pregnancy. I never freaked out or stressed out, I took every single day as it came and I couldn’t have been happier. But all that changed right after I gave birth. 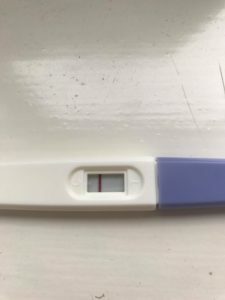 My pregnancy involved me moving to a new town to live with my boyfriend as I currently lived with my parents and at the time, even though I was a few hours away from everything I knew, it didn’t seem to bother me. The moment Mole was placed on my chest I got scared. My first words holding her were “oh my word what do I do?? ?” screaming out to the midwife. 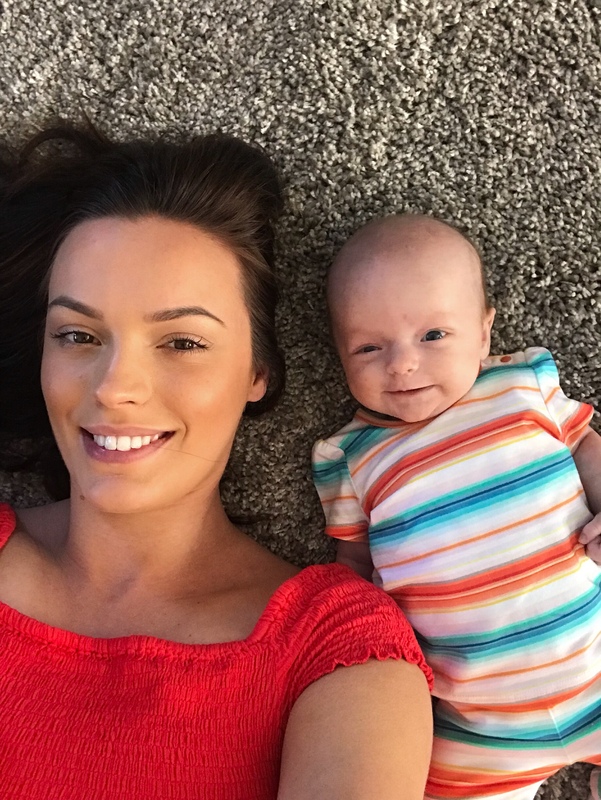 I had no experience with babies and I don’t even think I had held a baby before. It hit me, the huge amount of responsibility I had caring for her and I wanted to be perfect. After a few hours in hospital, the midwife came in and questioned me “have you not fed her yet?” in a stern tone. It was the “yet” in her question that stuck with me. I felt sick, I looked at Mole sleeping away in the little crib they have and thought, “why have I not fed you yet 🙁 ?” and then I thought “how do I even feed her?” I really did not have a clue what I was doing. 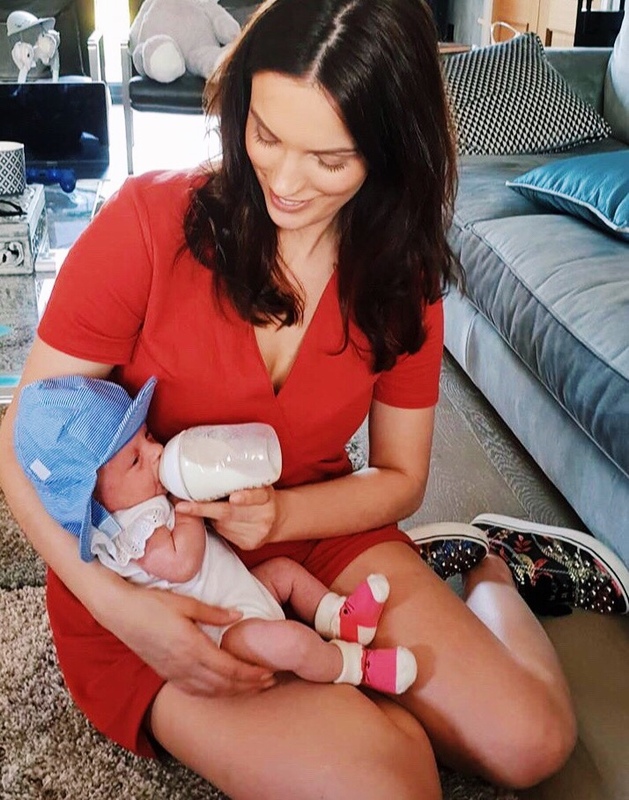 It took me 10 minutes to struggle changing a nappy and one of the most important responsibilities as a mother is feeding your baby and I had no clue how to even do it! The feelings of excitement and happiness started fading away. 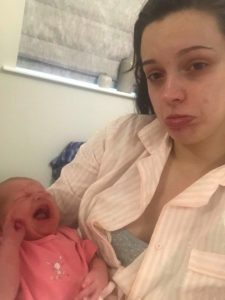 Struggling to breastfeed at the start gave me so much anxiety. From not knowing when and how often she should be feeding to not knowing if I was doing it properly and Mole was having enough. This feeling still lasted when I took Mole home from the hospital. As soon as I walked through the doors with her she cried and cried and cried. I was trying to feed her every 40 minutes but she was constantly hungry. I was up all night for about a week. I saw every hour of the clock. It wasn’t till I spoke to my mum on the phone at how much I was struggling caring for her when she asked “are you winding her?” I didn’t even know what this meant! Again I felt like I was doing everything wrong and as a mother I should know all of this stuff. I’m not sure if anyone else has gone through this, I kept on getting flashbacks of the birth. But the painful bit. It was like I had PTSD from birth trauma! 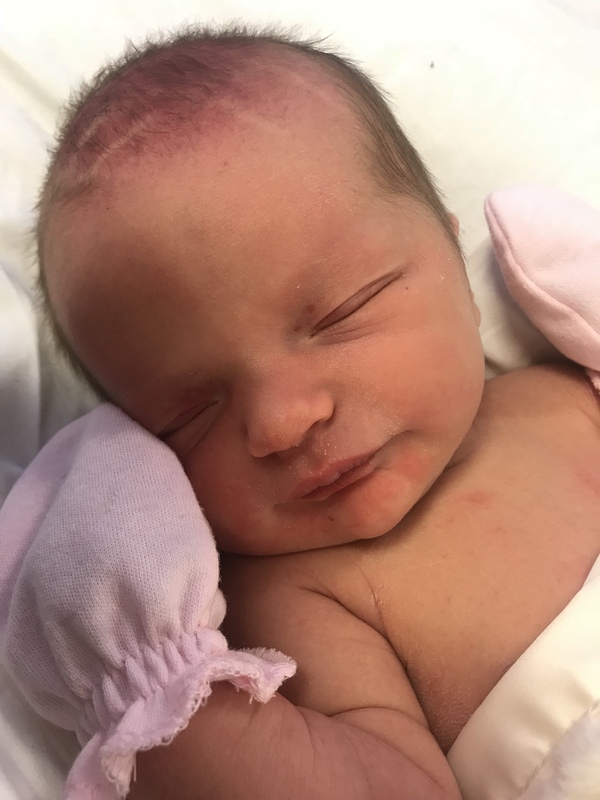 My birth story went really well actually, I don’t even know what I’m complaining about as so many women have it bad, yet, it was the most traumatic event that had ever happened to me. I had never had that pain before for hours on end. Every movement I did afterwards that hurt triggered a memory of screaming to push Mole out. I could even feel the pain again in my mind. Sadly, I could’t get to grips with how often I had to change Mole’s nappy. She would get so upset if she even just did a little wee in her nappy. For some reason I got this awful feeling of reflection. Spending most of my life in education to finally hold down a good job and now being off work to change countless nappies everyday. I don’t know why but it made me feel like a failure in my job. 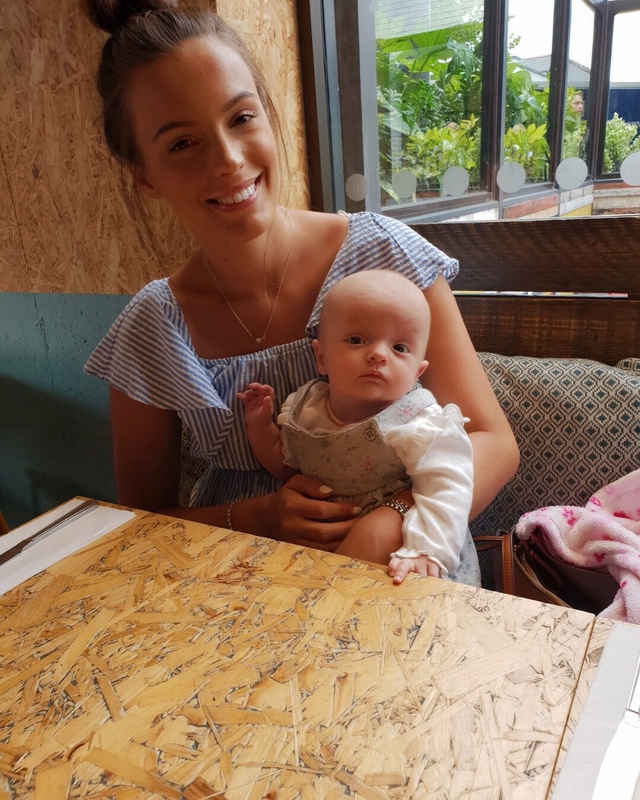 It was hard to convince people around me as well that just because i’m off work doesn’t mean that I do nothing but watch TV all day, I am constantly changing nappies and feeding. I am raising a life. 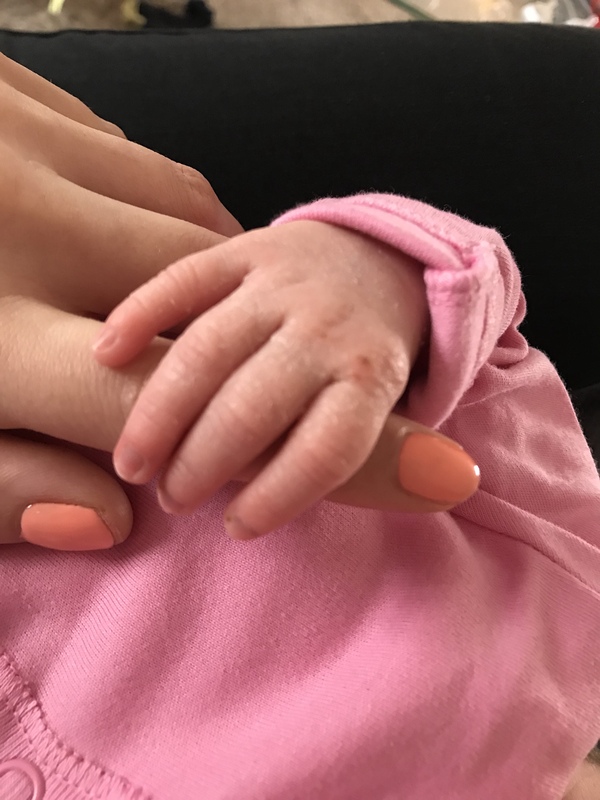 It was very hard to accept that being a mum is a full time job. Its the hardest full time job. And I am so grateful now that I can see it is the most rewarding full time job. Writing this now, remembering the thoughts I had about missing my old life has got me in disbelief. I’ve had Mole for 5 months now and I wouldn’t want my life any other way. I am so grateful to have her and the happiness she gives me every single day. Nothing in the world can make me as happy as she can. But, during the first few weeks I found myself mourning my previous life. My selfish life. Being able to shower when I wanted, sleep all night, go to the gym for two hours and not feel guilty. 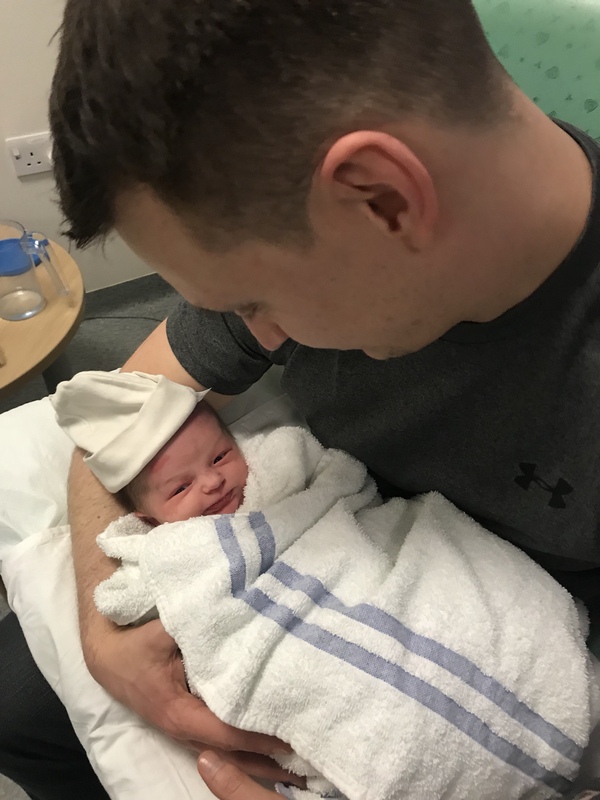 I would constantly question myself “What the hell have I done?” I’d gone from having it very cushy living with my parents and seeing my friends every weekend to being in a whole new town, not having anyone to help to caring for a newborn baby. I can’t tell you how many tears I shed during the first few weeks. Anything could set me off. 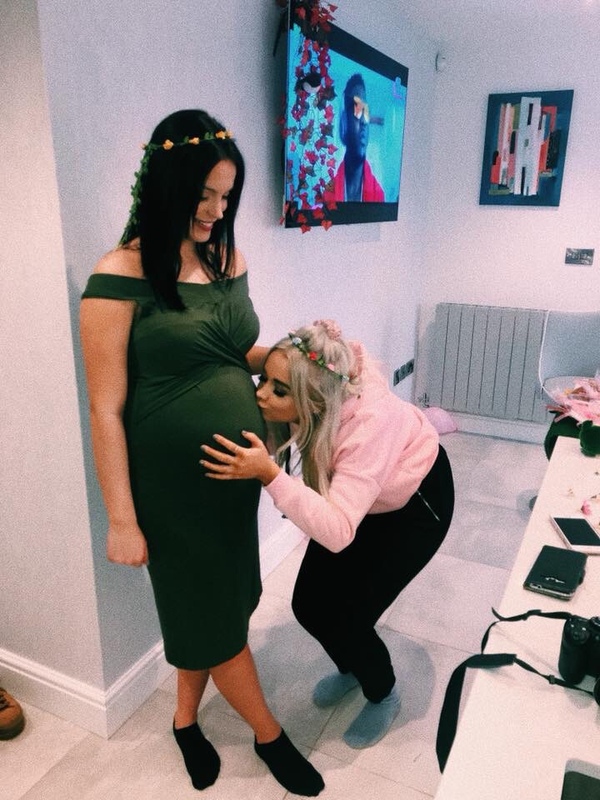 The worst was when the midwife at my check up appointments would ask how my mood was and I’d get a horrible lump in my throat and then i’d spend the rest of the session not listening to her properly because I’d be trying my hardest not to cry, then as soon as the session was over I’d just burst into tears. I didn’t want people to think I wasn’t coping because so many people have babies and they all seem to handle it pretty well. I wanted to be like them. A strong mum. I remember placing Mole on her play mat in front of the shower so I could multi-task watching her and getting to wash my hair. I’d step into the shower and cry. Looking at her whilst crying made me cry even harder because I felt guilty for crying when I was so lucky to have her. I’d get out of the shower and paint a smile on my face so know one could tell tears were streaming down my cheeks 5 minutes ago. I started to wonder if I had Post Natal Depression. But I didn’t have all of the main symptoms and some days were good days for me. I came across Baby Blues whilst researching my own symptoms and I fitted into this perfectly. It was strange really because after 2/3 weeks I felt normal. Like all of my previous feelings and struggles were just a dream. 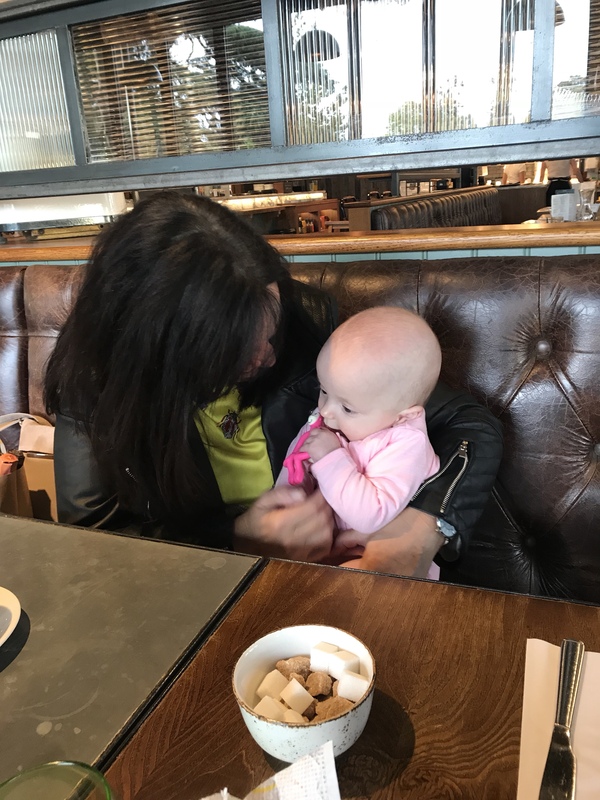 I started getting out of the house to baby classes and making new mum friends pouring my heart out to them, going on walks breathing in fresh air and began the process of loving my new life. I wake up every single day now so content and in love. Even through the bad nights of no sleep I look at Mole and smile. I almost hate myself for ever feeling the way I did the first few weeks of her life but sometimes you can’t control what is going to happen. Hormones have a huge role to play too and i’ve accepted that I can’t blame everything on myself. 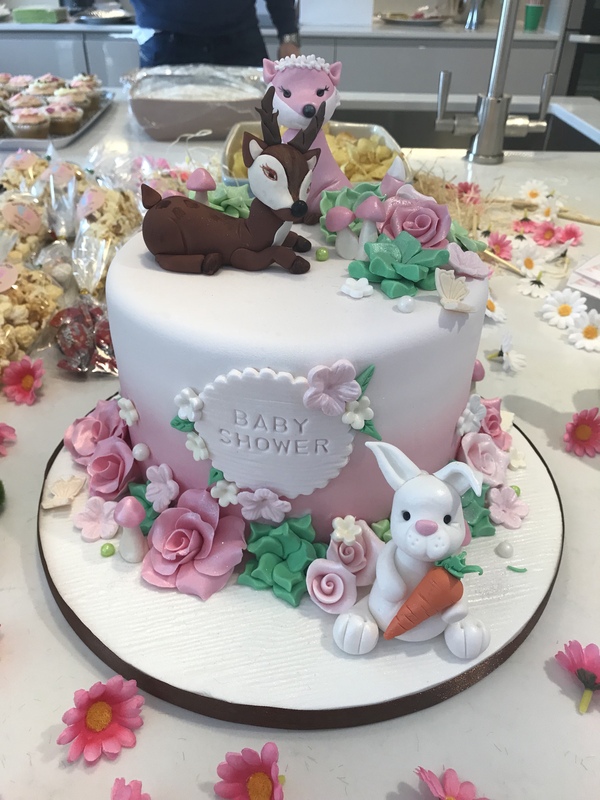 I can remember being so overwhelmed with ideas for a baby shower I just didn’t know where to start! 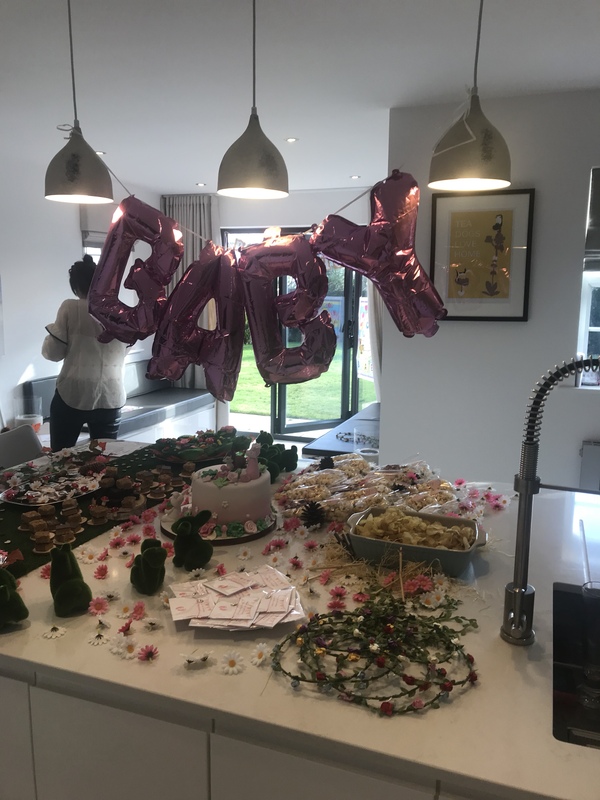 I narrowed down my ideas to wanting something rustic, natural colours with pops of pink but, not too over the top yet, girlie and fun ready to celebrate my beautiful baby girl. Yes thats my version of narrowed down lol. Will the theme suitable for all ages? Will the theme fit my budget? 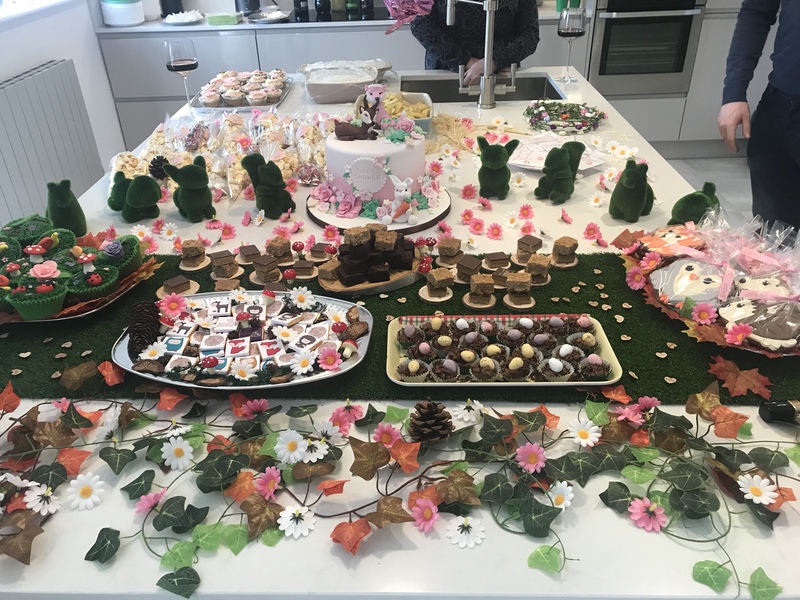 Will there be enough decorations and favours to make the theme obvious? Will the decorations I plan to get fit into the space okay? 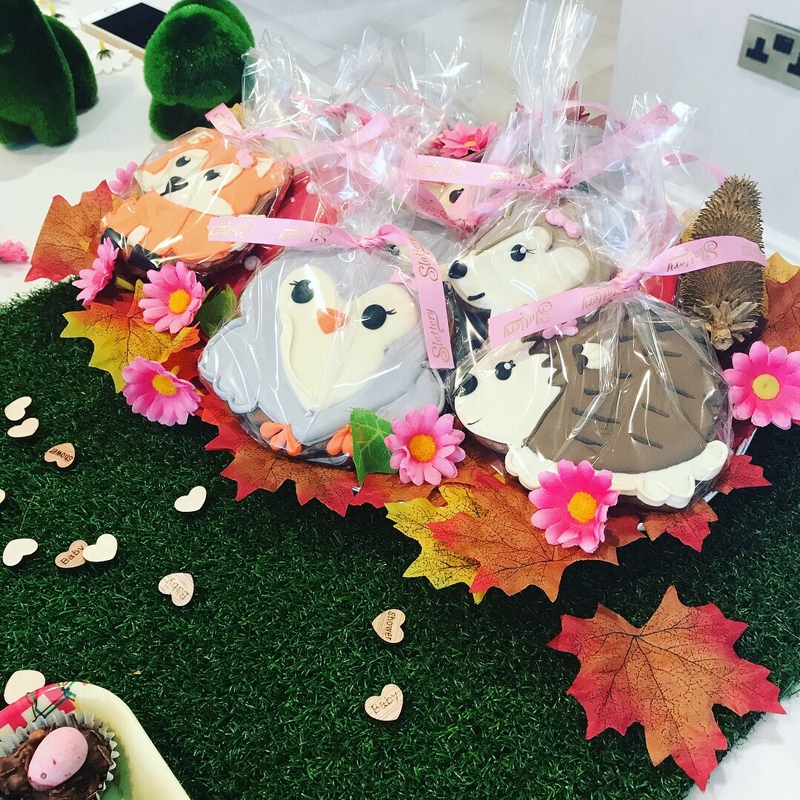 The Woodland Theme fitted perfectly with this and I knew I had plenty of options for decorations and party favours. 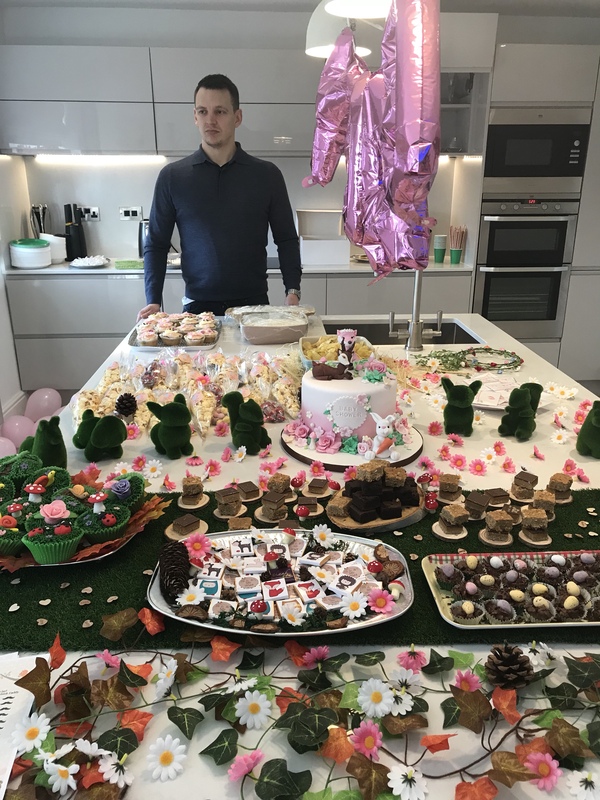 I had never planned a party before and this one felt extra special to me because it was for my baby, even though she was in my belly, so it had to be just right 🙂 Plus, whilst you’re pregnant with your first, you seem to have all the time in the world to spend hours looking on Amazon at artificial grass and leaves. 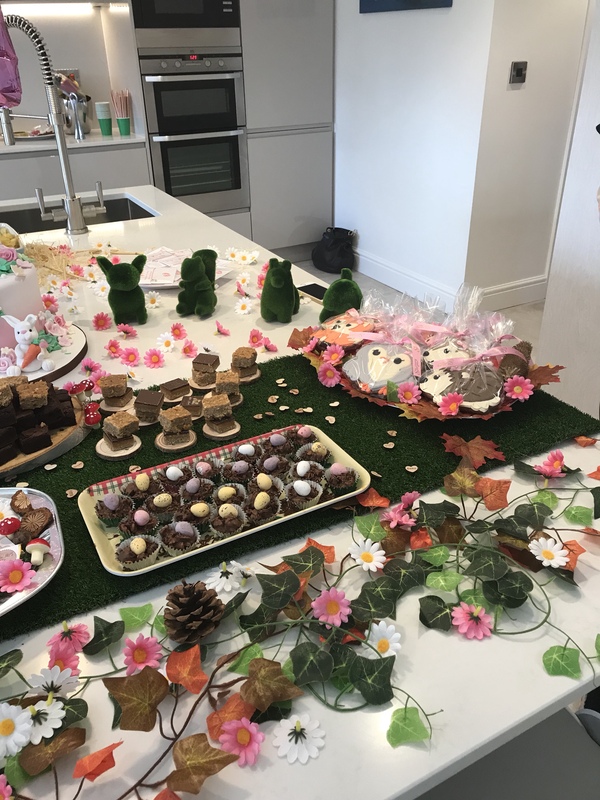 The Baby Shower took place in my kitchen and I invited a fair amount of guests so I had to be sure whilst there was enough food, favours and games for everyone it wasn’t too crowded in the kitchen. I’m one of those very lucky girls who has a big island in the middle of the kitchen. I had always dreamed of this. I knew thats where I want the display and all of the guests can crowd around there plus we have extra seating in the kitchen too. I started of planning my theme by looking for a table cloth. Something green or brown to set the tone. I soon realised that I wouldn’t have even got a table cloth to fit the island. Can baby brain start when you’re pregnant? Instead I opted for an artificial grass runner. It was a great idea if I do say so myself. Automatically it set the scene of being outside. 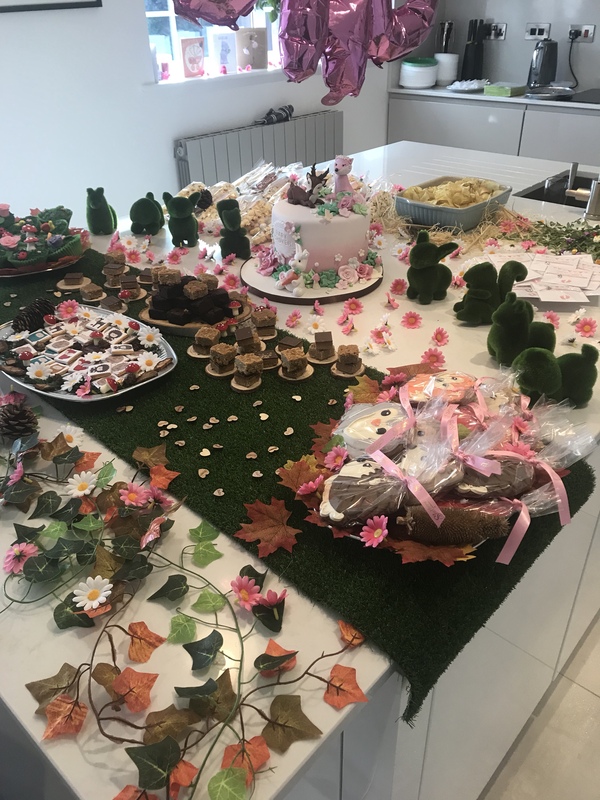 It’s also perfect for cutting to size and I liked the width as it didn’t cover too much of the table leaving more room for other decorations. As there was still space on the table I used a hanging vine draped over the table, which helped with adding colour and texture. I also used bunches of leaves to hang from the TV on the wall so the decorations were not just placed on the table and it tied the whole room together. My vision was to have all different tiers of food on logs however, this because pretty pricey. Instead I purchased a few flat log disks to place different food items on. 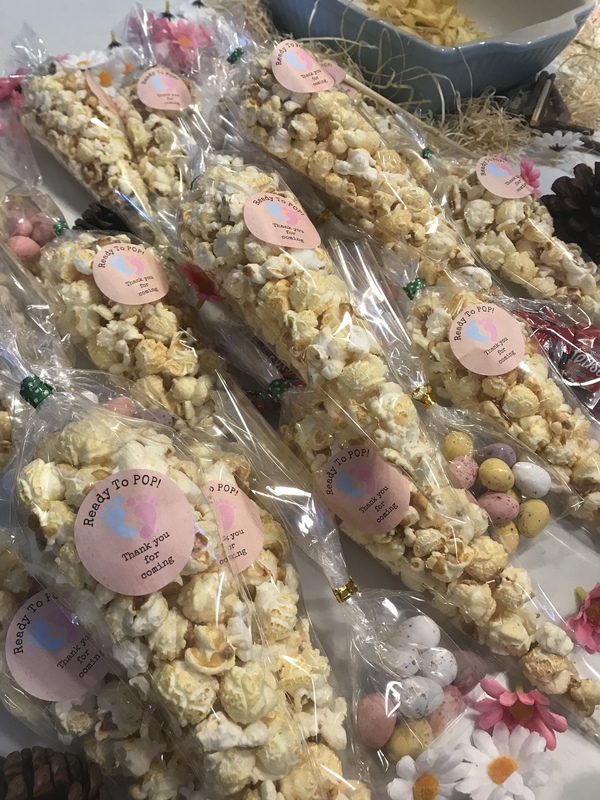 They came in a pack of 20, were rather small but brilliant for holding a mini flapjack or other nibbles! I purchased a natural log slice that was bigger to hold a selection of mini bites on. This looked great and varied the food placing. The natural log effect helped give off the rustic vibe. For any other food placemats I just used plain old foiled trays that you can get from your local supermarket for pretty cheap! One of the biggest decorations for make an impact was the table confetti. My favourite was the rustic, wooden hearts with “Baby Shower” wrote on them. I sprinkled them all over the artificial grass runner. They also do “Baby Girl” or “Baby Boy” ones too. 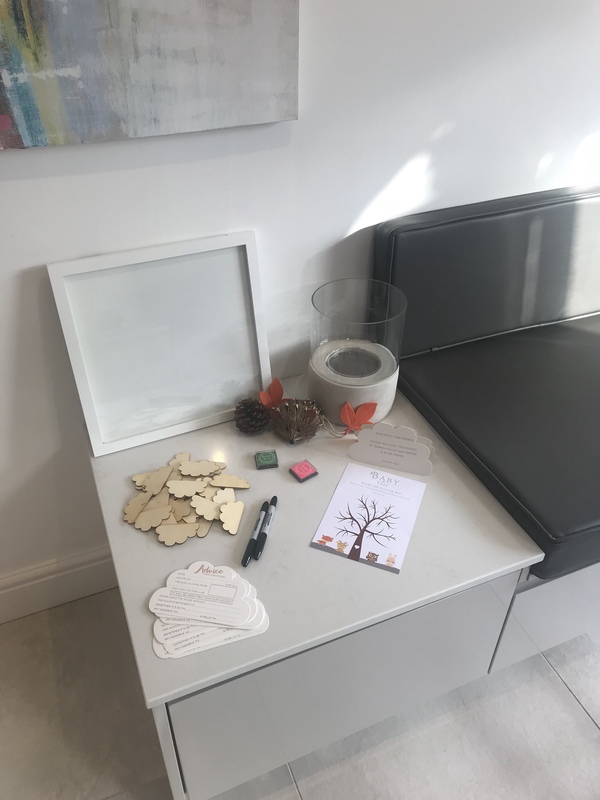 You can buy the Wooden Hearts here: https://amzn.to/2MH3Y0W £2.99 for 50. Other table confetti I used was artificial flowers. I kept the colour scheme of the two flowers white and pink to keep it girlie yet not overdone. 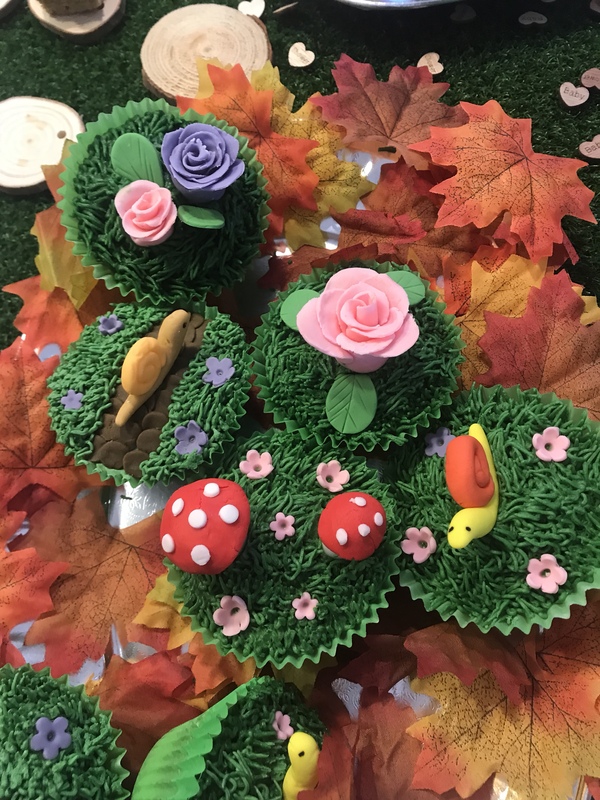 To decorate the nibbles wire toadstools were brilliant. You can bend them to shape in any direction as if they were growing from the ground. 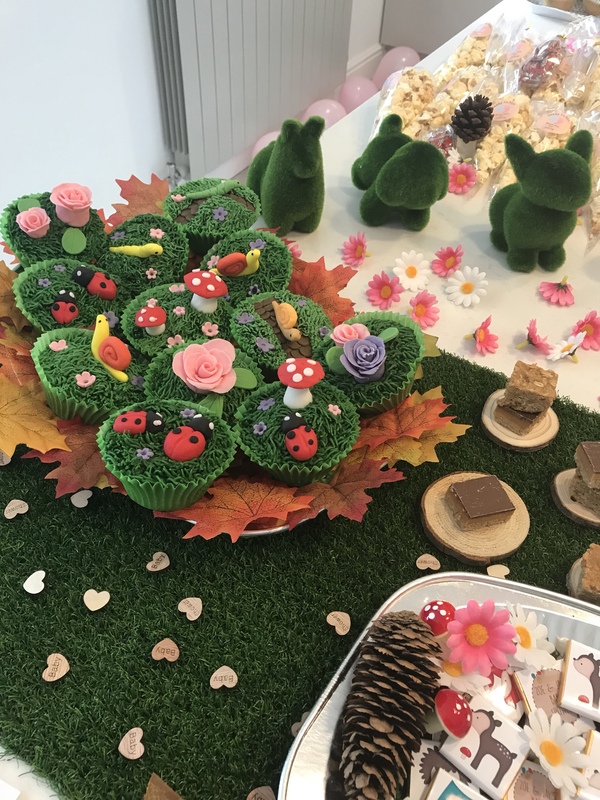 The contrasting red colour of the toadstool was very bold compared to the neutral colours of the brownies and flapjacks. Around other food placemats I purchased some Photo Props and mini pine cones. 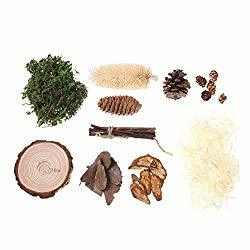 The photo props were great as the pack contained twigs, moss and log slices. I found artificial grass animals and they looked really good with the theme! I placed them around the display. 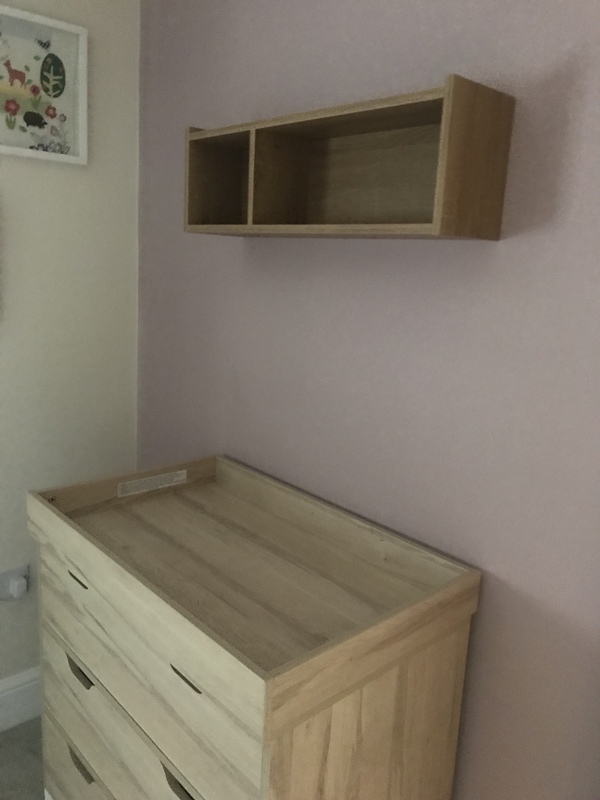 When they first arrived I was thinking oh i’m not sure what to do with these but when the display got going they fitted in perfectly. 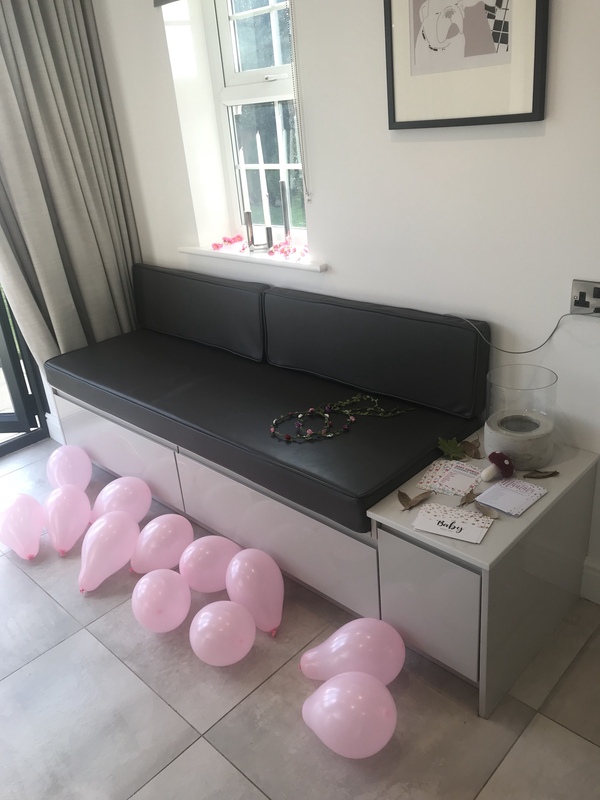 I filled the floor with pink balloons and had the main balloon attraction was a foiled ballon saying baby hanging from the lights. 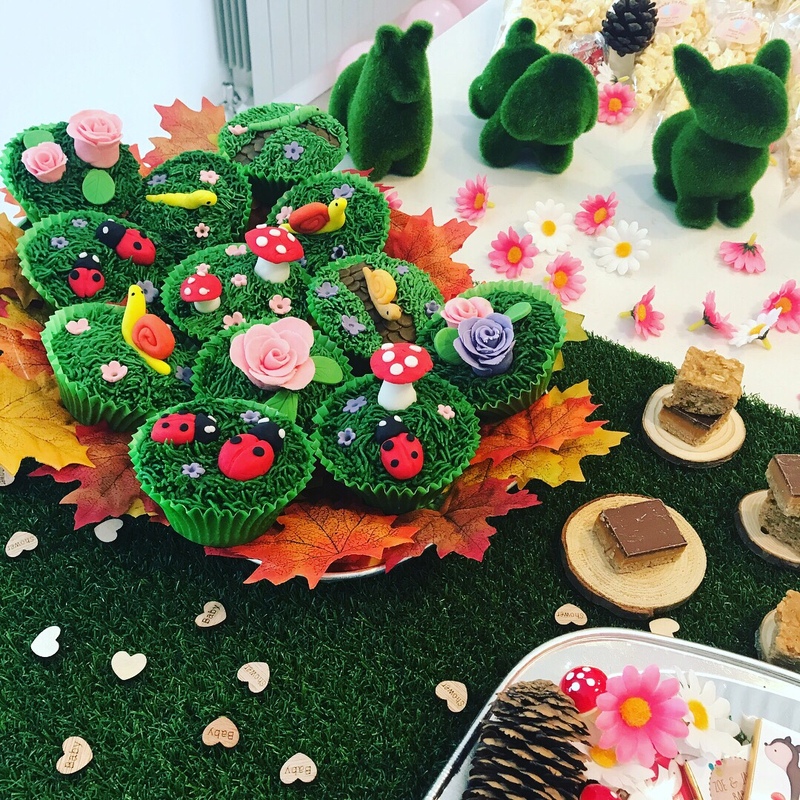 The star of the show was the cake! It bought the whole theme together and it couldn’t have been more perfect. The cake was a total surprise too off my sisters. 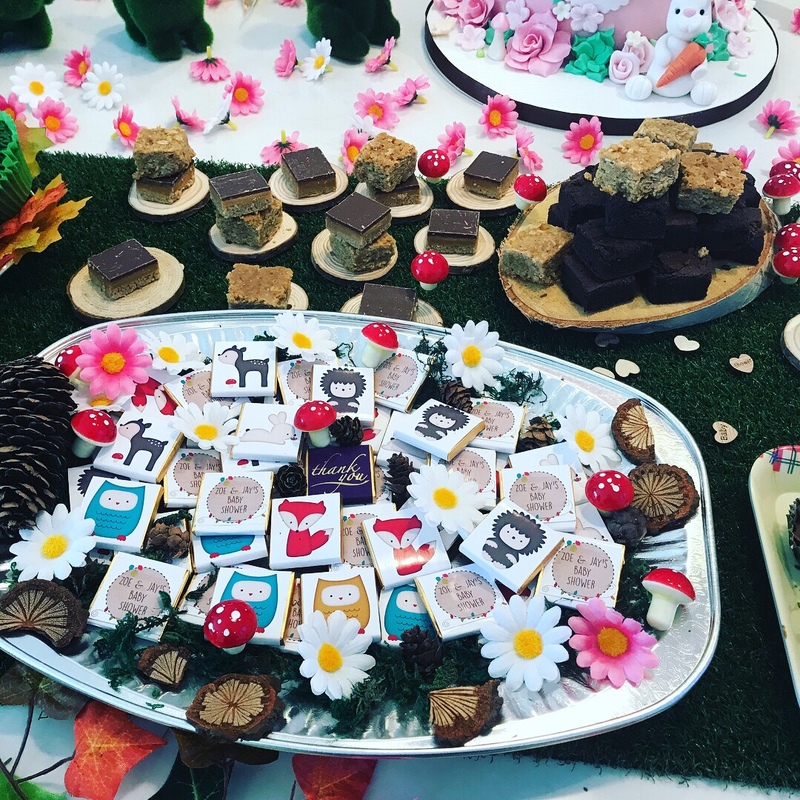 I had biscuits from Slattery’s made that were Woodland Themed too! 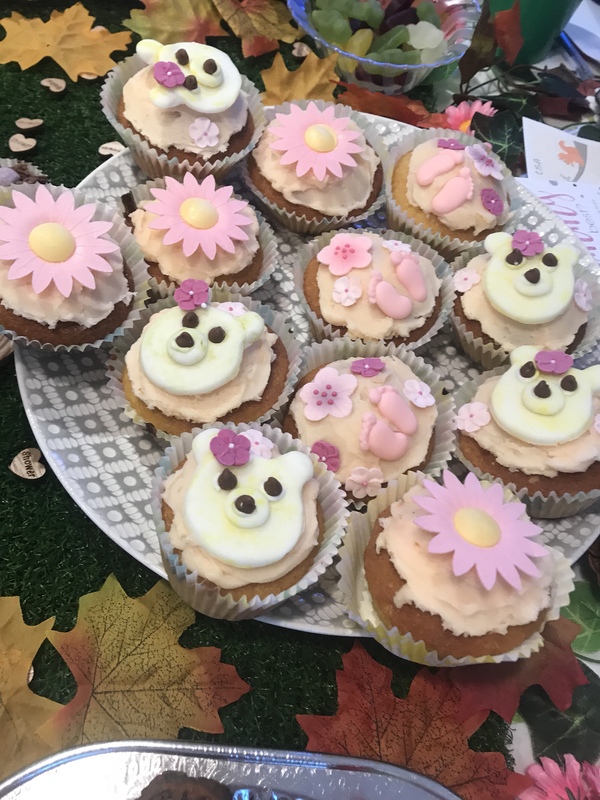 And Jay’s Mum made the cutest fairy cakes!! I had hot food on a display elsewhere in the kitchen and kept the sweet food on the display. 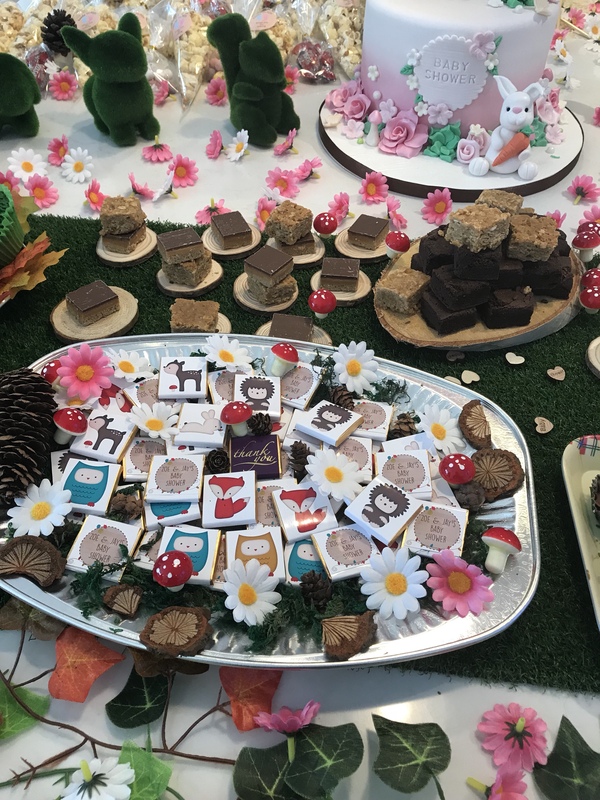 The personalised woodland themed chocolates looked great on the display. They tasted great too! 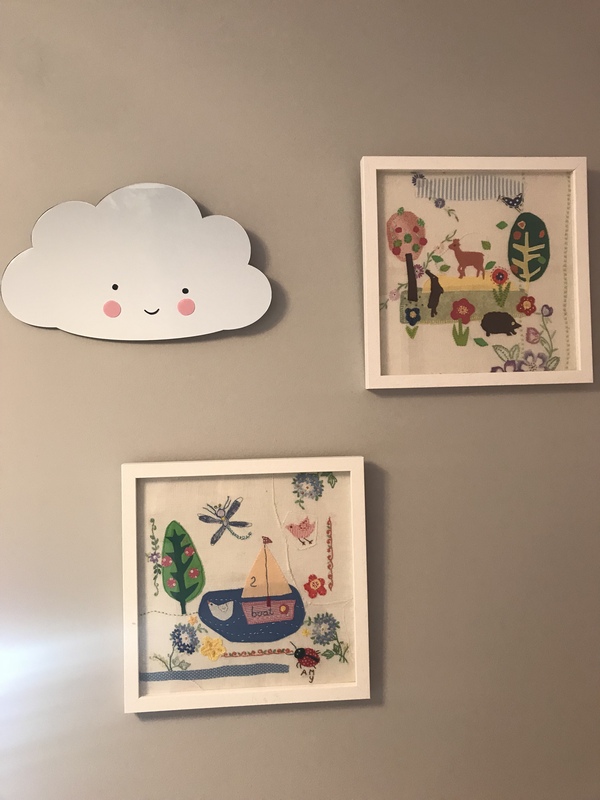 My guest book was actually a frame where you signed a cloud and inserted it into the frame. The only problem was that I got Sharpie pens and the ink ran on everyones clouds so I recommend a normal biro pen. Pin the dummy on the baby. Overall the whole day was incredible. I had so much fun planning it for everyone and then putting it all together in the morning with my sister. I couldn’t have asked for a better day and I know my guests had a lovely time too! We both got hit hard with the 4 month sleep regression and now this :'( TEETHING. 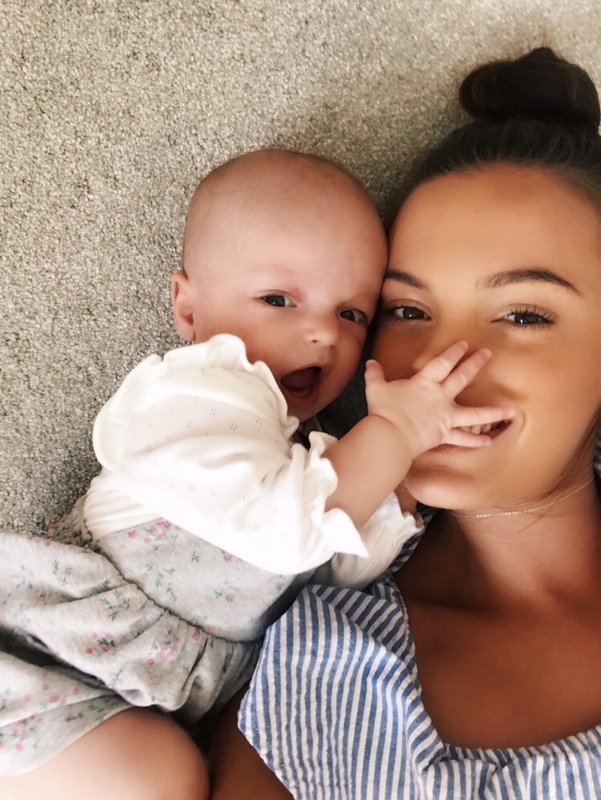 As Mole is my first baby I have no previous experience with a teething baby. I didn’t even know for sure whether what Mole was going through is down to teething until I found myself yet again on Google checking all her symptoms fearing for the worst. Mole has no teeth so far and I was unsure that she was teething because at 4 months old babies do a lot of exploring and learning with their mouth and she has always been one to chew her toys. I had to look out for other symptoms to be sure before I started on any pain killers for no reason. Chewing on her hands: Scary really because she chews on her fingers that much I am surprised there is anything left of them. If she is not chewing on her own fingers then she is grabbing mine! Flushed Cheeks: This one was difficult for me to notice as we had just come back off holiday and Mole had a cheeky tan. A few weeks later now we are back and the tan has gone I can see her cheeks get flushed when she is on a chewing frenzy. 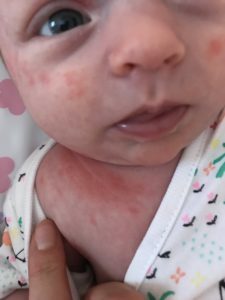 Rubbing her face: This is one of Mole’s symptoms for when she is tired so it was a harder one to spot for teething but she has definitely started rubbing at her face in an agitated way. I have to keep checking her nails are super short so she doesn’t scratch herself. 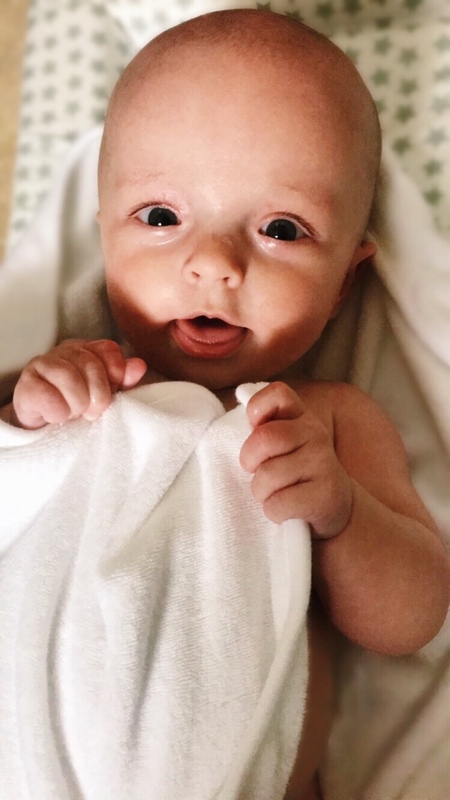 Trouble sleeping: 🙁 🙁 🙁 when you just get out of the 4 month sleep regression and then get hit with this one. She really can not sleep with her teething troubles. 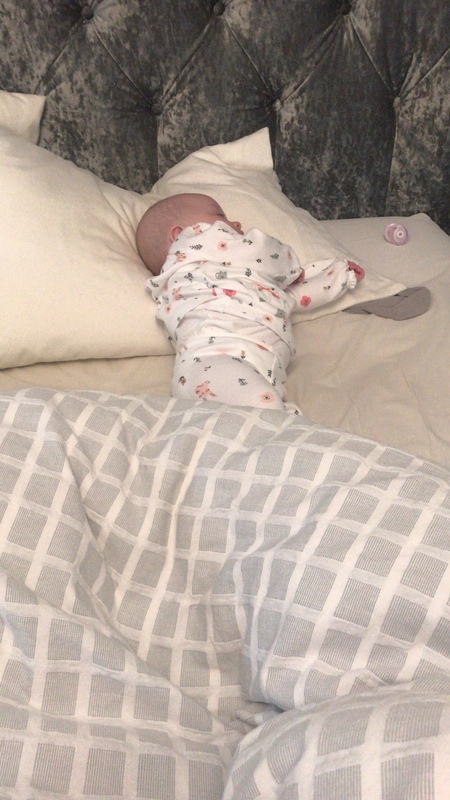 Her naps during the day have decreased and at night she is waking up almost hourly again and when she is awake she finds it so hard to fall back to sleep again. Coffee is my best friend right now. Saying NO to food: Mole is a bottle guzzler. Theres no question about it. 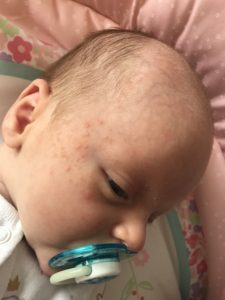 However, She has recently started pushing the bottle away out of her mouth yet at the same time crying because she is hungry. On the other hand some days are different, which leads me onto my next point. Comfort eating: If she is not pushing the bottle out of her mouth in a temper tantrum she is comfort eating. She will have her bottle even when she is not really hungry or she will have her bottle as a method to fall back to sleep. I may be in the wrong allowing myself to comfort feed my baby but when it is 3:30 in the morning and you have been up 4 times all ready, you pretty much do anything for them to fall back to sleep. I have saved the best till last. Symptom number 8: Explosive poo’s! You know the kind that go up the back and through to their best clothes. TMI. But it is related. Calpol: It is a shame this heavenly stuff doesn’t come on a drip. Now, I am the type of person who won’t take a paracetamol even if my leg is falling off, I’m just not into putting lot’s of medicine into your body if you can really get through it without it if you know what I mean. So I was reluctant to give Mole Calpol but she really needed it. 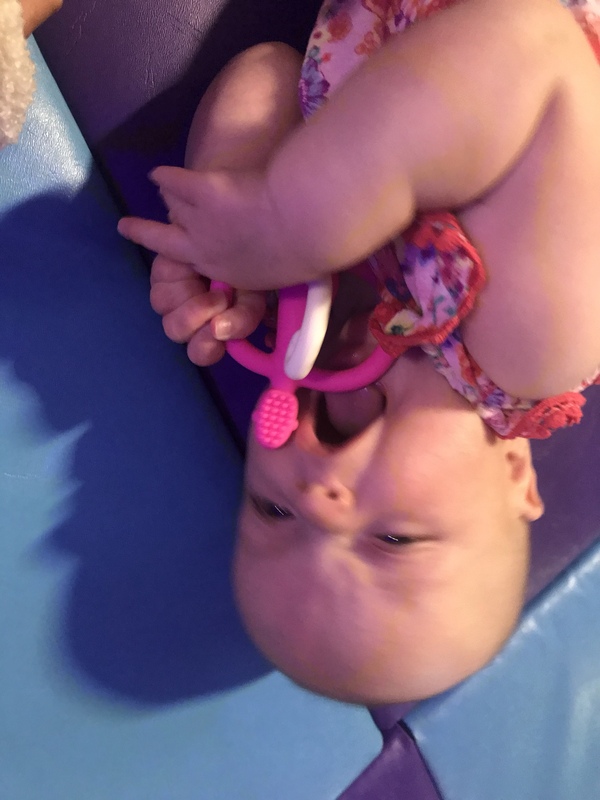 Teething can be so painful for them and they are really not themselves whilst going through teething. Calpol helps to relieve her pain and I notice a big difference in her mood 15 minutes later. Giving my baby paracetamol has helped to bring Mole’s temperature down. Especially at night when she has trouble sleeping due to her pain, it has given her the chance to get her head down for a couple of hours pain free. Pack extra nappies and a change of clothes: As I mentioned before one of Mole’s symptoms have been her bottom. Now I have come to terms with excepting its going to be part of my day dealing with this and getting myself prepared for the inevitable, I have coped much easier. 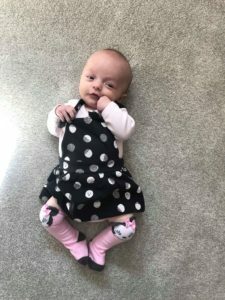 Let’s face it, you have just spent what little money you have from your maternity pay on the cutest outfit ever for your baby and then they go all chicken korma on you. It will test your patience. Especially if you’re out without a spare change of clothes for them. 😮 . Teething Gel: Mole is currently having Dentinox Teething Gel. I use a clean finger or rub it over her Matchstick Monkey to apply it to her gums. So far it can ease her pain for around 20 minutes and then you are allowed to apply more. I also believe that the taste of the teething gel distracts her from the pain for a short while too. 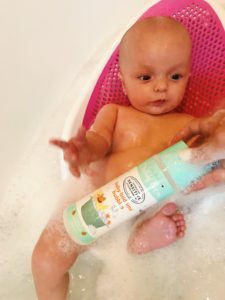 Using the teething gel alone, has not been the best solution to completely stopping her pain, but it has helped to comfort her just a little and as Tesco would say “every little helps” 😉 . I have saved the best tip till last 😀 … Lot’s of cuddles and kisses!!!!! Mole has been extra clingy whilst teething and secretly I am loving this side of her. 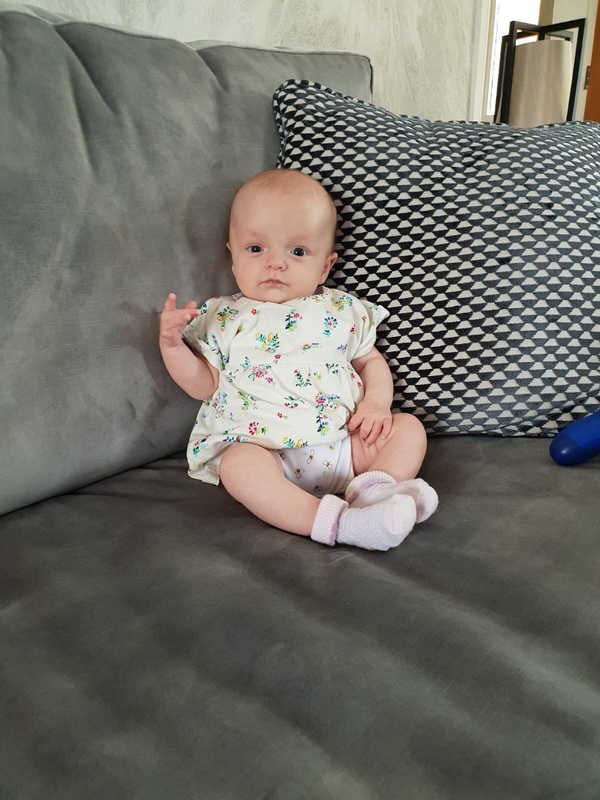 I have been having daytime bed cuddles with her, cuddling her whilst watching Baby TV (her favourite) and holding her hand whilst out and about. There is no medicine out there like mummy’s cuddle medicine. I hope you find some of the tips here useful! 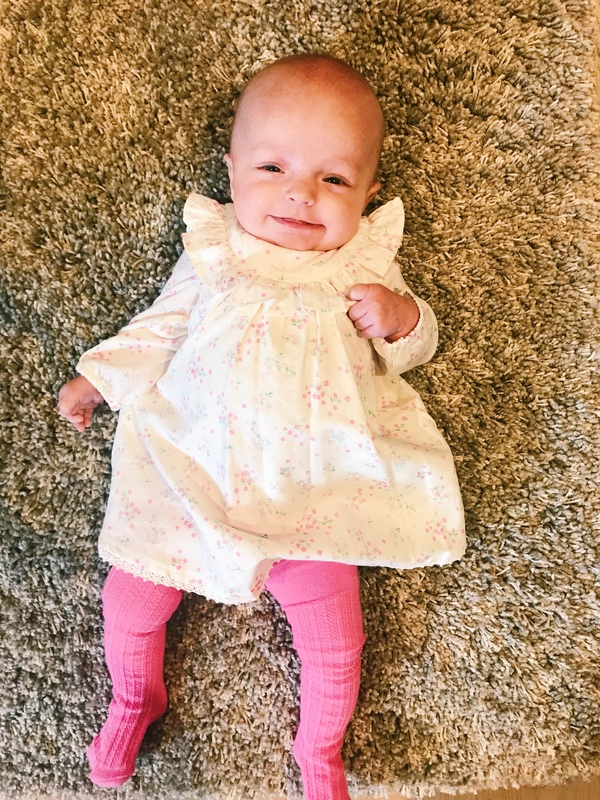 I CAN NOT BELIEVE SHE IS 4 MONTHS OLD! Where did that time go???? You hear it all the time… “They grow so quick”, “they change so quick”, “Make the most of them being a baby”… Everyone was so right and now I have found myself jumping on the bandwagon with the sayings. This fourth month has been the best by far. I feel our bond is so much stronger and tighter than ever. This is also the month where I have seen the most change with her. Mole’s favourite thing to do is to play on her play mat, I always lay her down on her back, the next second she just rolled on to her belly! She did it so fast as well I couldn’t believe it 😀 .It has got to the point now where Mole with keep rolling every time she is on her back so I now have to make sure everywhere is fully safe and watch her when I can. It’s not so fun when she decides to keep rolling when I am putting her to sleep in her SnuzPod. I didn’t think there would even be enough room but apparently there is! I have even woke up in the middle of the night and noticed she has rolled. Mrs Roly Poly can keep her head up for a good while whilst on her front now but after a good 5-10 minutes she starts to tire and I can hear “eh, eeeeh, arr, arghhh, EEHHARGH” coming from her little mouth. She gets so frustrated when she is tired and can’t figure out to roll back over. I think this is by far one of Mole’s favourite past times. She will literally just lie there gurgling away. It is crazy because I still see her as a little baby and I can’t believe she will have a back and forth conversation. Sure its just gargling but I understand her 🙂 . For some reason she turns into the biggest Little Miss Chatterbox right before bedtime. It is like she is almost trying to convince me she isn’t tired enough for bed yet haha. Along with making different noises I heard her first real, proper, kind of adult like laugh!!! She has only done this the once so far and I have spent every day since doing goodness knows what to get her to do it again. 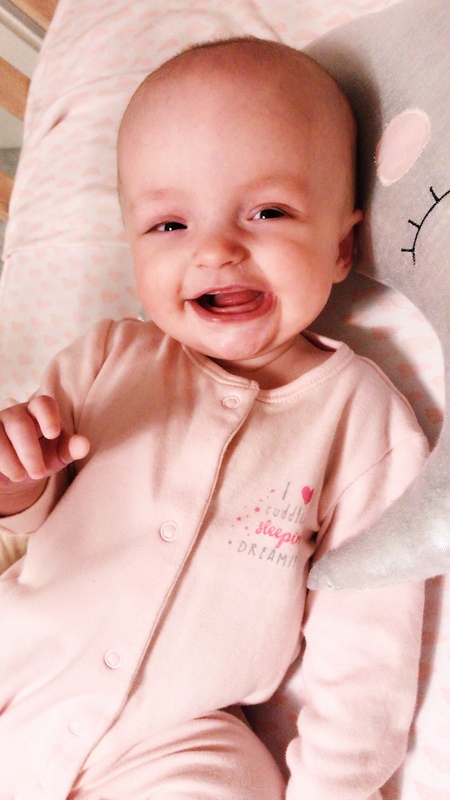 She has her usual giggle noises especially when I tickle her but this laugh she did was so different. It genuinely was one of the best moments of my life hearing it. The 4 month sleep regression has hit us hard. Yes me too, what is sleep? I can put her to bed and she look fast asleep, next minute I am up and down the stairs for her every 40 minutes. Any tips??? When Mole does finally go to sleep it is for two hours then she needs feeding again. She has also become really clingy where she wants to hold my hand until she falls asleep. I know I shouldn’t give in but I cant help think to myself that she will be asleep in 10 minutes if I let her do it. She already has me wrapped around her little finger. Oh boy, where do I start with this one. 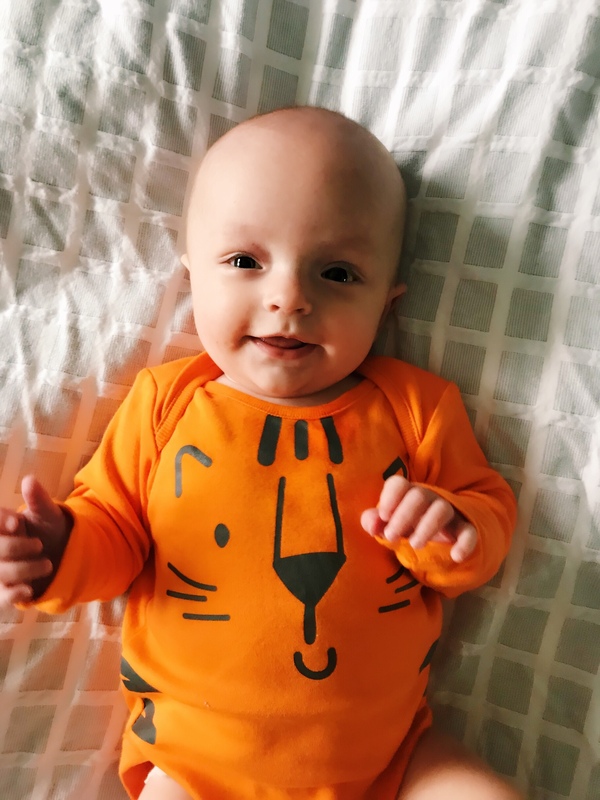 The dreaded word Reflux. From a newborn Mole would continuously cry, scream, all night long. People told me that is what newborns are like but I knew that couldn’t be the case with Mole. 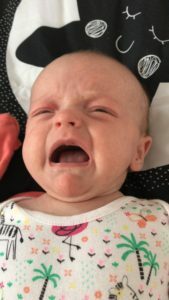 The type of cry she would do wasn’t her hungry cry or her colic cry, it would mainly happen in the evening and I would literally see every hour of the clock go by night after night. I felt like my soul was leaving my body I was that sleep deprived. 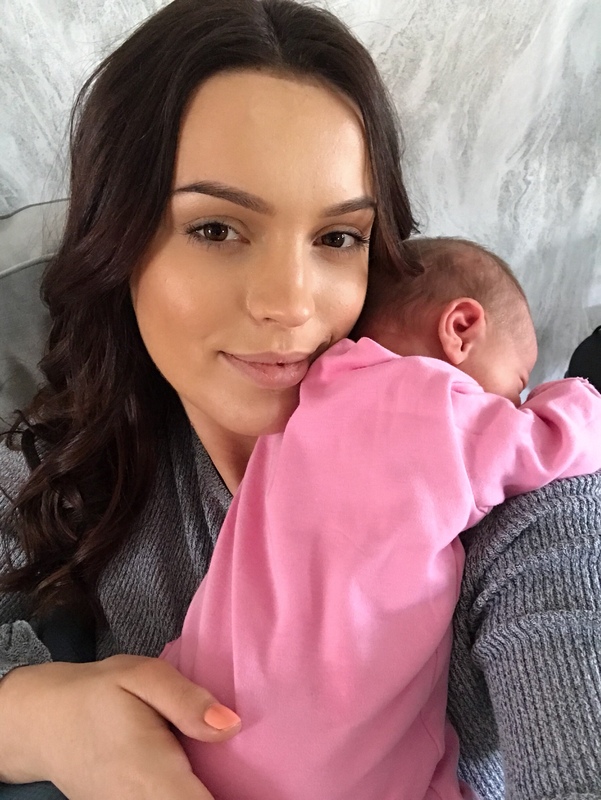 I began to research her cry and came across reflux websites that would also describe other symptoms Mole had but, because I was a first time mum, with no experience what so ever with babies, I thought that is just what babies are like. From day one in the hospital with Mole I remember holding her and suddenly she got hiccups at only a few hours old. I asked the midwife what I should do and she replied “nothing it is completely normal, maybe just rub her back to comfort her”. So thats exactly what I did, and I never thought anything else of it, every single day when she got hiccups. 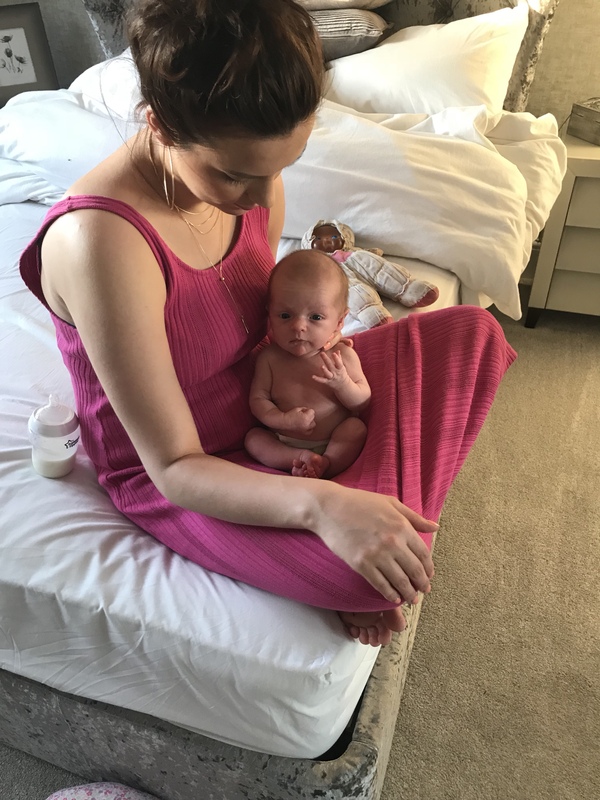 I tried my hardest to breastfeed Mole and I lasted for around 7 weeks after that it just didn’t work out for both of us. During breastfeeding Mole would become irritable and keep breaking away from her latch. Sometimes she would start to cry again and the cry would louder and louder. It was heartbreaking to watch and I began to blame myself on being a ‘bad breastfeeder’. 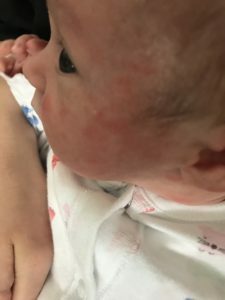 Making the transition to formula milk and feeding Mole through bottles I noticed the same symptom. Struggling with feeding. 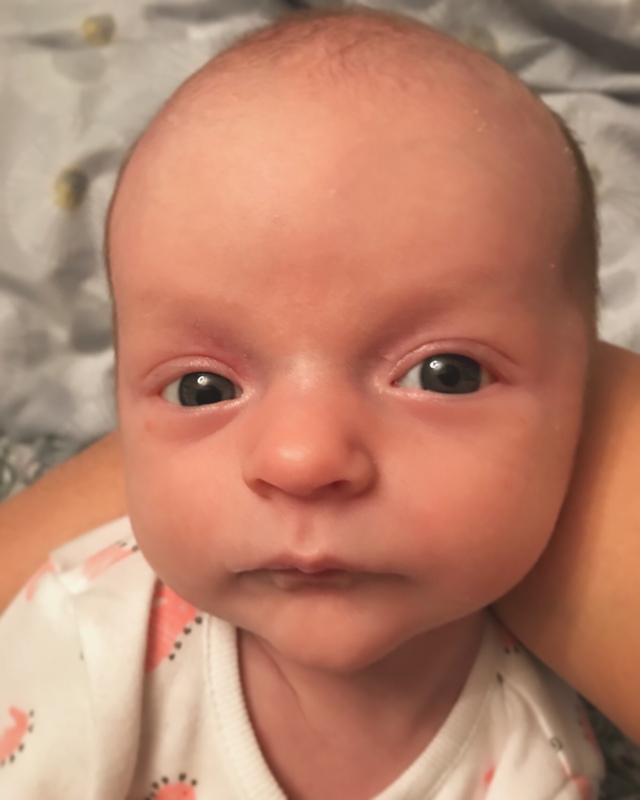 Constantly turning her head and refusing the bottle or having a small amount of milk and then 10 minutes later wanting another small amount. It got to the point where Mole would start to choke on her feed and then not long after she began refusing her feeds. Her weight wasn’t increasing and I became more and more concerned. This was a huge symptom. Every single time I would lie Mole on her back, bam, she would scream her loudest!. 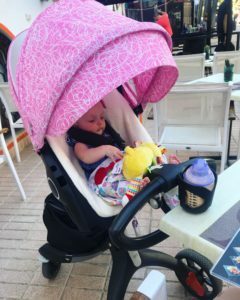 I originally had a carry cot on her pram and every single time I placed her in the pram she would scream, but when I would pick her up, she would stop. 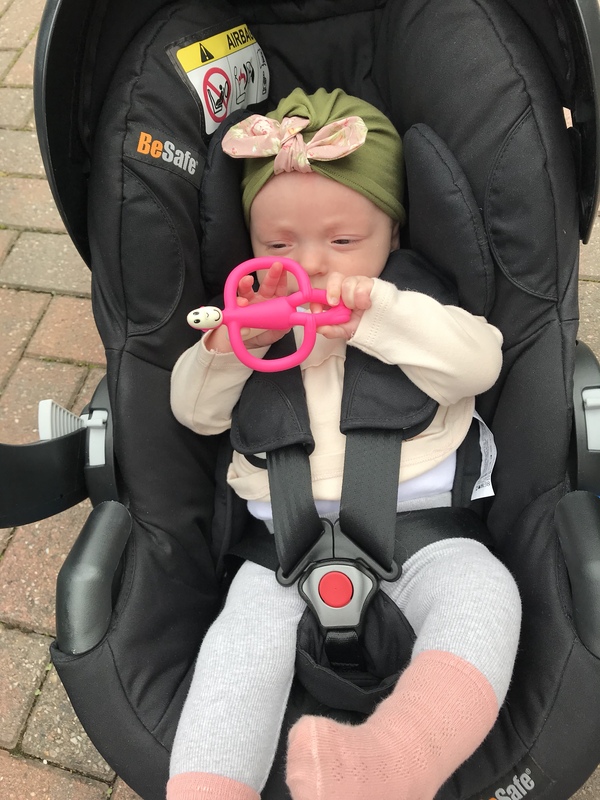 I use to dread taking her out of the house because I would put her in the pram and listen to her cry but at the time I had no idea it was reflux. Night feeding her got really hard. She would struggle taking her bottle and then when I put her back in her cot she would cry again. I felt like I couldn’t do anything right. 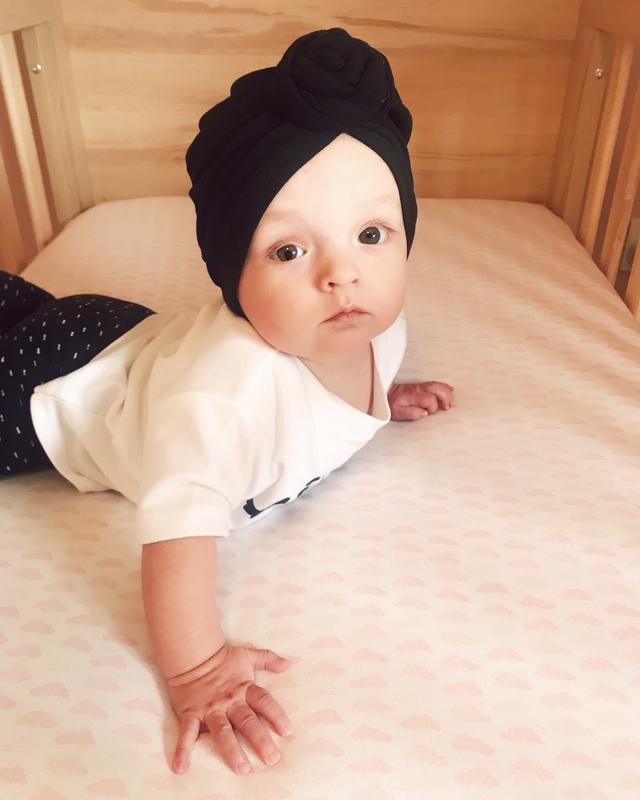 One night, I propped her up on my pillow, whilst I had my head in my hands crying and I noticed that she stopped and I was the only one crying now. Being on a slant helped her. I propped her bed up slightly and managed to get some sleep. 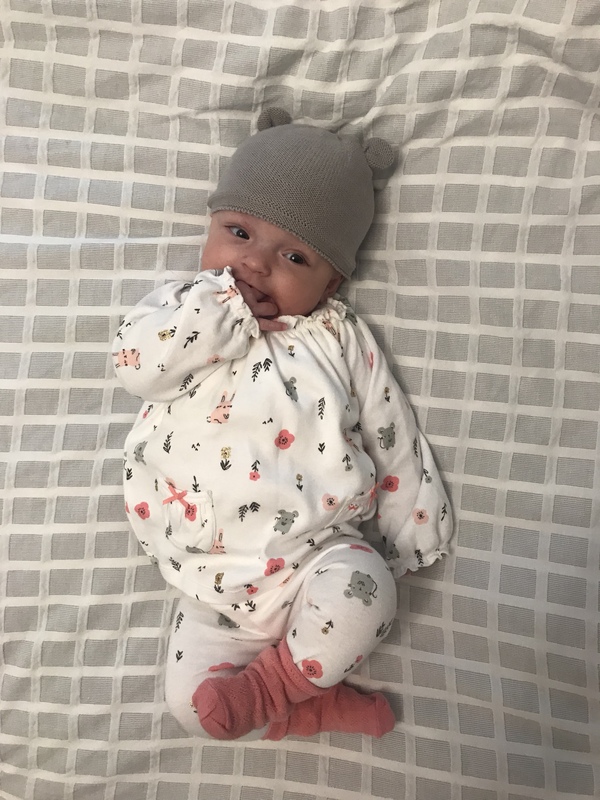 At first Mole would do small spit ups after her feeds and I didn’t think anything of it as people told me that is normal for babies. When Mole began to take on more milk it got worse. way worse. She would projectile vomit all over. An alarming amount. She would go through numerous clothes changes a day (me too) and get stuck in the viscous circle of crying because of her vomit then crying because she was hungry. 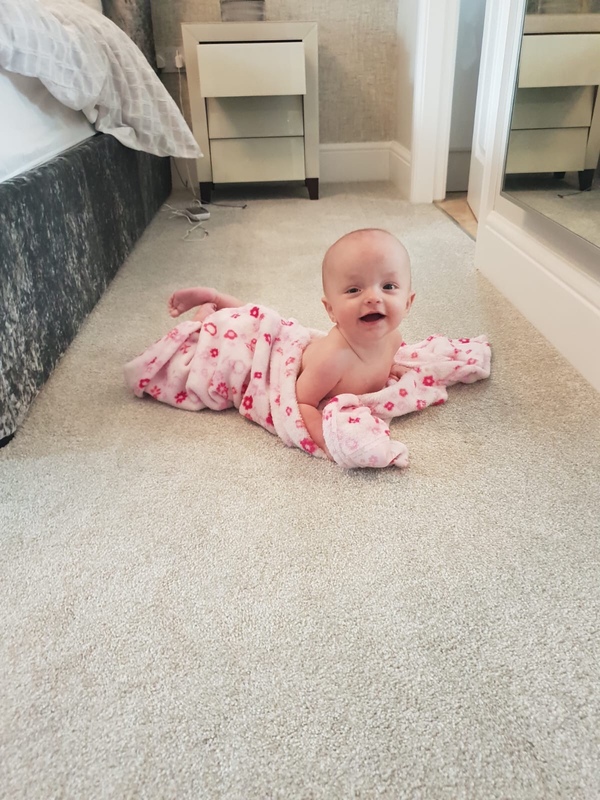 I felt so trapped in the house because it would have been so unfair to take her out whilst she was sick after every feed. 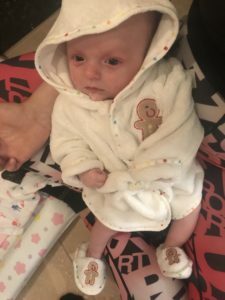 My life became an ongoing roundabout of feeding her, cleaning up her sick changing her nappy and then dealing with her shrieking cry 🙁 I could not help but moan about it or become upset. Mole from birth would always do grunting noises. The grunts use to make me giggle and I would copy them too at her then pull her in for a snuggle. Little did I know this was a reflux symptom. Reflux occurs because a baby’s food pipe (oesophagus) is still developing. 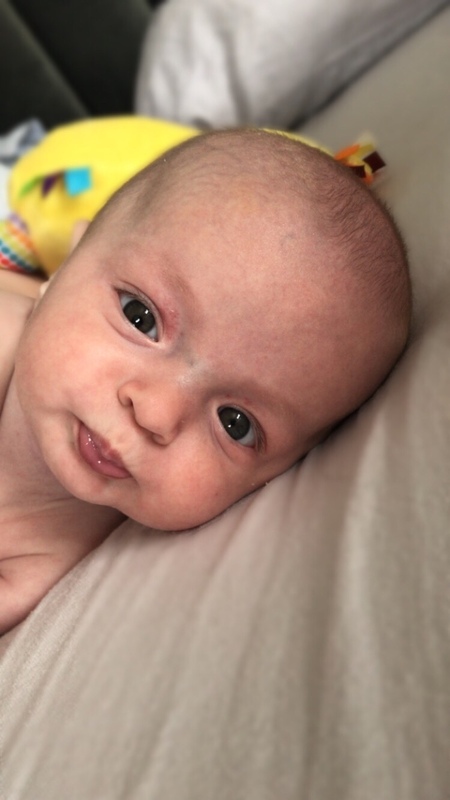 As the baby gets older the reflux should stop as the ring of muscle at the bottom of their oesophagus fully develops and stops stomach contents leaking out. 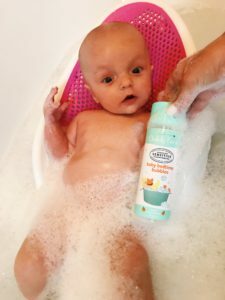 There are many types of milk formula out there that brands have made specifically for reflux babies. The formula is thicker than normal formula stopping the milk from coming back up. I tried Mole with a popular brand of anti-reflux milk but it did not suit her stomach. The doctors prescribed her with Gaviscon. The same method as the anti-reflux milk, thickening the formula so it is harder to come back up. She was allowed up to 6 sachets of Gaviscon in her bottles a day. Mole was okay with just 4, anymore than that and she would become constipated and cry for hours with that problem. One thing after another 🙁 . The Gaviscon worked for a few weeks and I thought I had sorted the problem. But her reflux came back, hard! Going back to the doctor he prescribed Ranitidine. The doctor explained that this will reduce her stomach acid but she became even worse on this medicine. I’m not even giving my time to it writing about it now. Bad, bad, bad. I didn’t even want Mole to be continuously on medicine either. I was back at square one with searching for an answer. 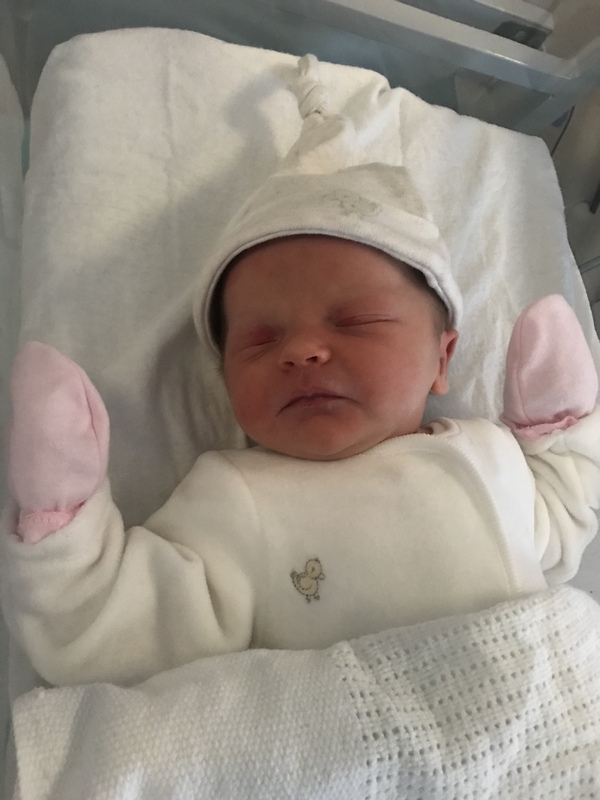 The doctor said the next step would be an operation on her stomach and I was determined to try another way before the operation was the answer. I came across an article that talked about how an Osteopath can help. An Osteopath can give a baby a deep massage loosening any tight muscles and joints. 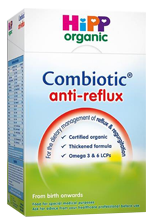 Tight muscles and joints especially around the stomach area can cause reflux. An Osteopath will release all stresses in the baby. 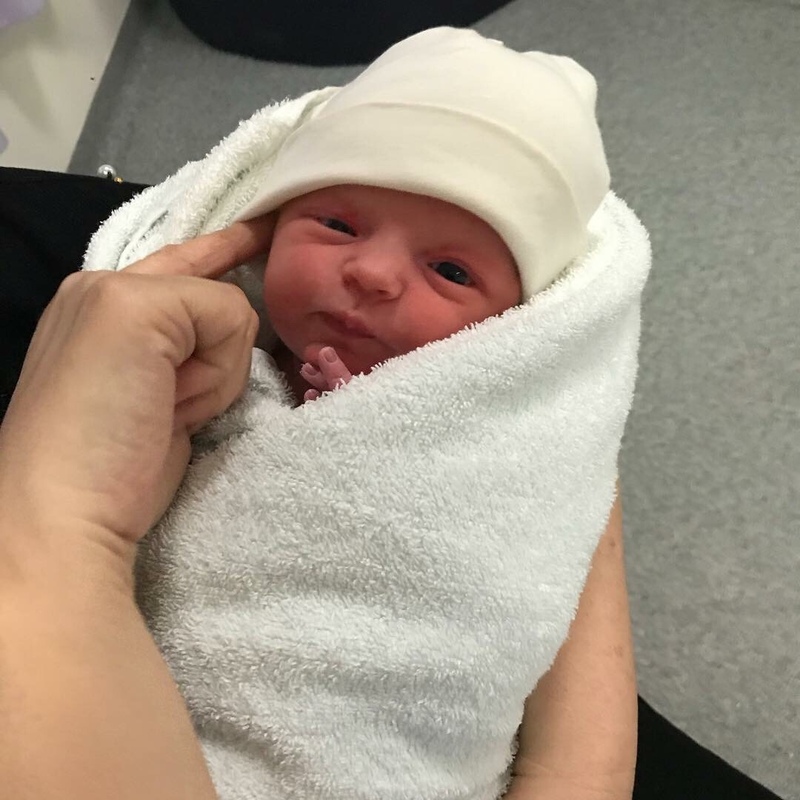 Babies with tight muscles are more likely to benefit from the treatment than those who’s ring of muscle at the bottom of their oesophagus has not developed. If you think about it, a baby has gone through delivery and growing at a phenomenal rate, their body must be tight. I thought well what the heck, let’s try it. Mole had a 45 minute massage with Rachel and loved every minute! From that night, I took her off all medicine, including her Gaviscon and went cold turkey. NO REFLUX 😀 . The next day I thought no way, surely just a massage can’t have cured her reflux? but day after day Mole was still reflux free. I booked in a couple more sessions with Rachel and still Mole had gone from vomiting every feed to keeping all her feed down. It seems a lifetime ago I was dealing with Mole’s reflux. Even writing this blog post now I’m shocked remembering what we went through together. It is beautiful to see Mole at her happiest now and most of all I can leave the house and go to different activities with her without being riddled with anxiety. As selfish as this sounds, I feel like I have my life back. If your baby suffers from Reflux, please try an Osteopath. It may not work but it is worth a try. It certainly worked for me. Please note that not all Osteopaths treat babies, I had to check with a few first. I’m so glad I found Rachel, I genuinely don’t know what I would have done without her! 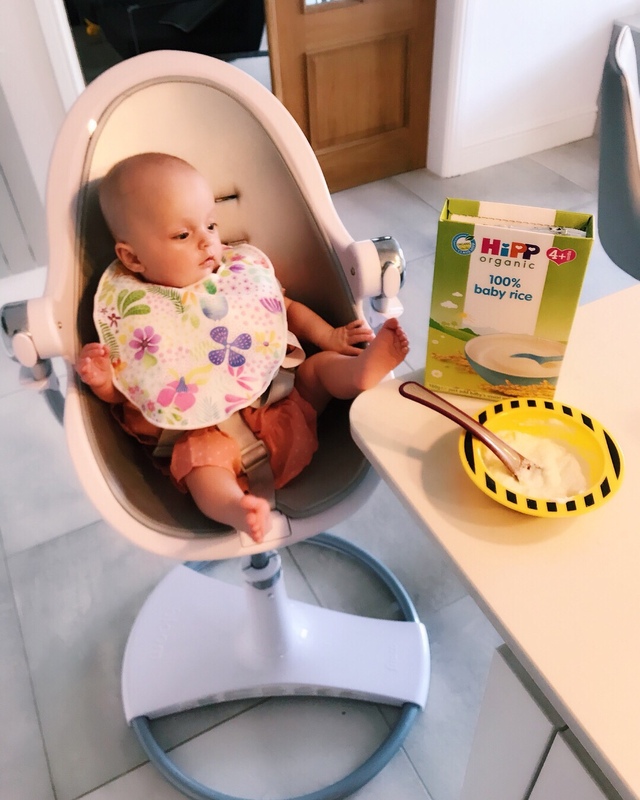 Keeping your baby upright for at least half an hour after a feed can help to make your baby more comfortable. 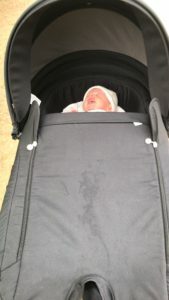 Another change I made was her pram. 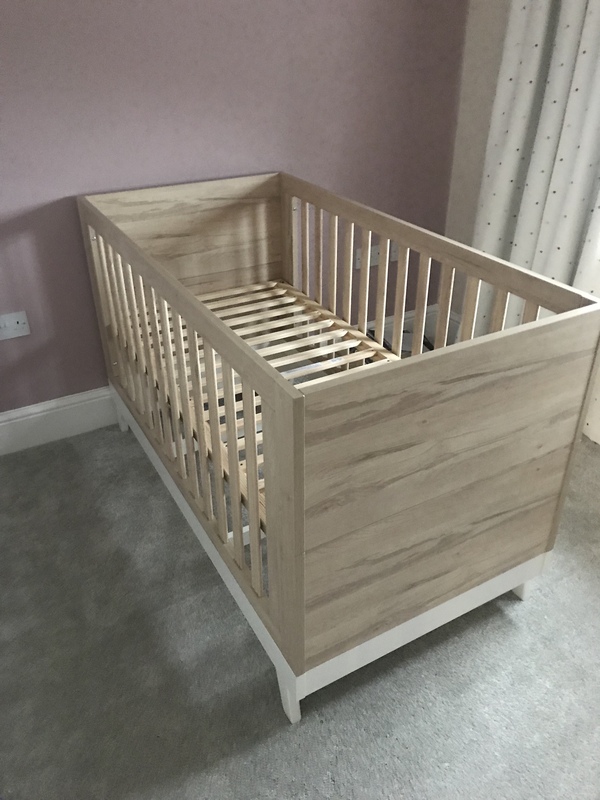 I got rid of her carry cot and got her a pram that would sit her upright. Taking her out was not an issue anymore and she is so much more comfortable. If I feed her whilst out I do not need to worry about holding her upright for half an hour as she is already sat up right in the pram. 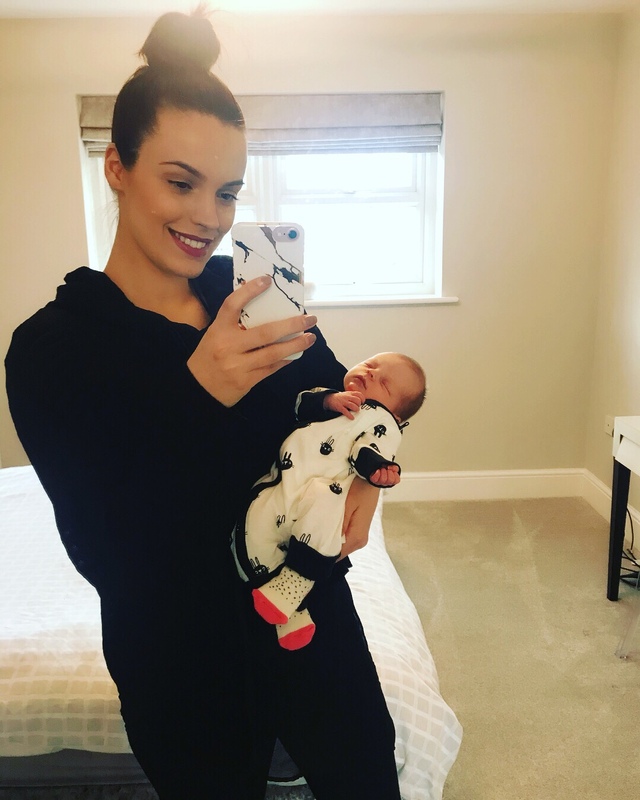 It didn’t work for Mole but I have heard tonnes of positive reviews on anti-reflux milk helping their baby to be more comfortable and to keep their milk down. If you have not tried this, it is definitely worth a go. 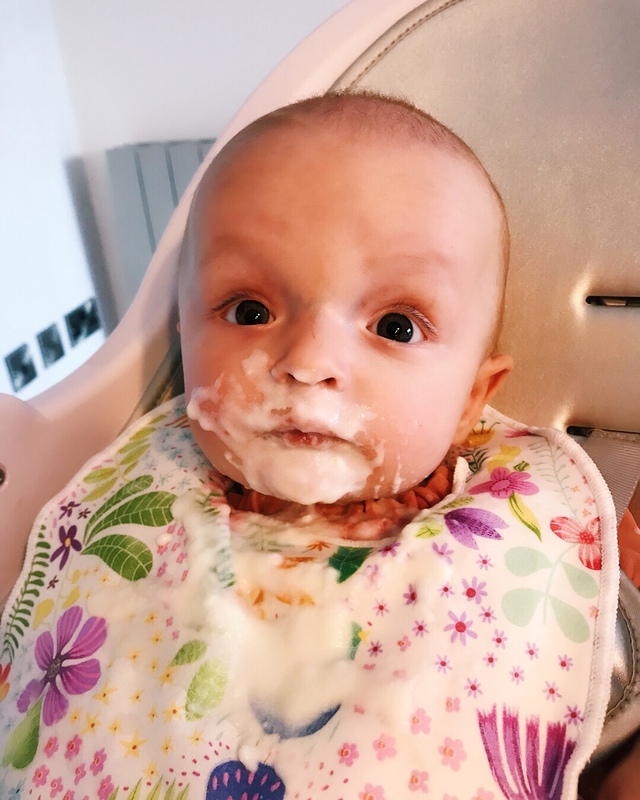 Feeding your baby little and often can help. Their stomachs will have less milk to regurgitate decreasing the chance of reflux. Speak to your doctor about what is safe to add to your baby’s milk to thicken it. This will decrease the chances of it being bought back up. I added Infant Gaviscon and it worked brilliantly for a while. Always speak to your doctor first to make sure your baby is having the best care. 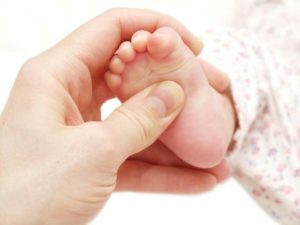 According to reflexology experts, massaging your baby’s feet in specific areas can settle an upset or fussy baby. Reflexology is a natural pain relief that is done by massaging pressure points throughout the body to relieve pain. Sounds crazy right? Like how can a massage on the feet calm my baby down? Won’t it just agitate my baby more? 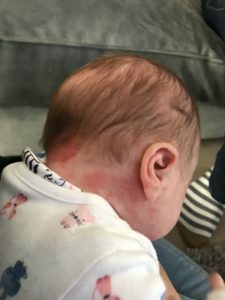 I came across this idea when I was researching different ways to help Molly’s reflux and noticed that when she was having a fussy day or she was crying more than usual and nothing I normally do to try and soothe her worked, this method had an immediate impact. For it to work, I bathed Molly first. This is one of her usual ways she likes to calm down. The warm water encourages blood flow to her feet which makes the massage more effective. 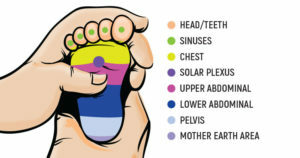 Different points in the foot work for different areas of your baby’s body. 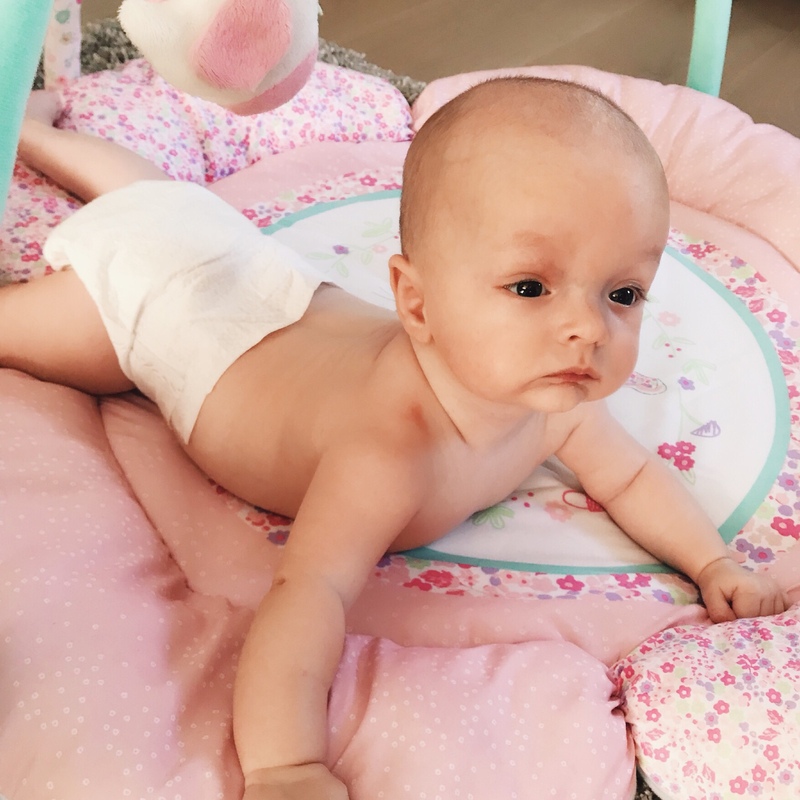 If your baby has trouble with a specific area, then you can focus your massage on that area. It may take a few tries to get use to it but keep at it! Trust me. Babies grow at an unbelievable rate! You know yourself, you look at them one day and the next they have doubled in size. Growing at a fast rate can cause pain in their hips as some areas of their body grows quicker than other areas. To solve this problem: Rub your baby’s heel. Rubbing the heel area can help babies if they suffer from upset stomachs or constipation too. 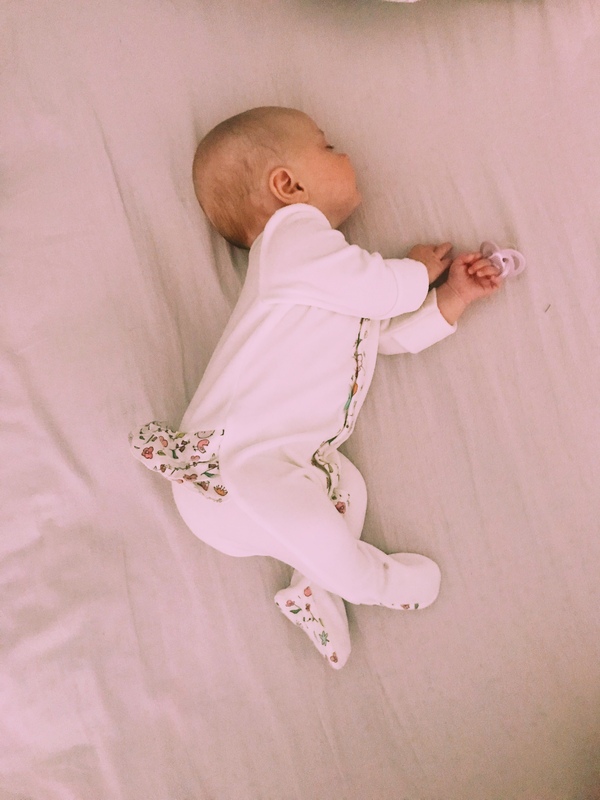 Massaging the space in the middle of your baby’s foot and the pads of their feet can help problems with heartburn, indigestion and constipation. Massaging the middle of the foot and heel will help problems with bloating and painful gas. 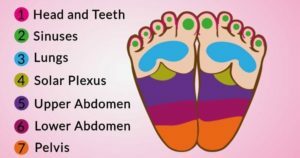 Massaging the center of the foot just below the pads of the feet where the arch begins will help to solve the problem of upset tummies, tightness and spasms. How can massaging the middle of a foot help with stomach pain I asked myself? Well, the center of the foot is a direct link to a collection of nerves between the lungs and stomach called the Solar Plexus. Massaging the pad area below your baby’s toes and above the arch can help with congestion in the chest and coughing problems. Apply a gentle pressure and massage in a circular motion for this to work. Saving the best till last. Massaging the very tips of your baby’s toes can help to ease the pain of tooth ache. When your baby is teething you feel helpless in being able to cure their pain. You give them Calpol but sometimes it is nice to have a natural pain relief remedy for teething babies. Massaging the tips of their toes can help to distract your baby from the pain too and the massage can even be done when your baby is asleep. 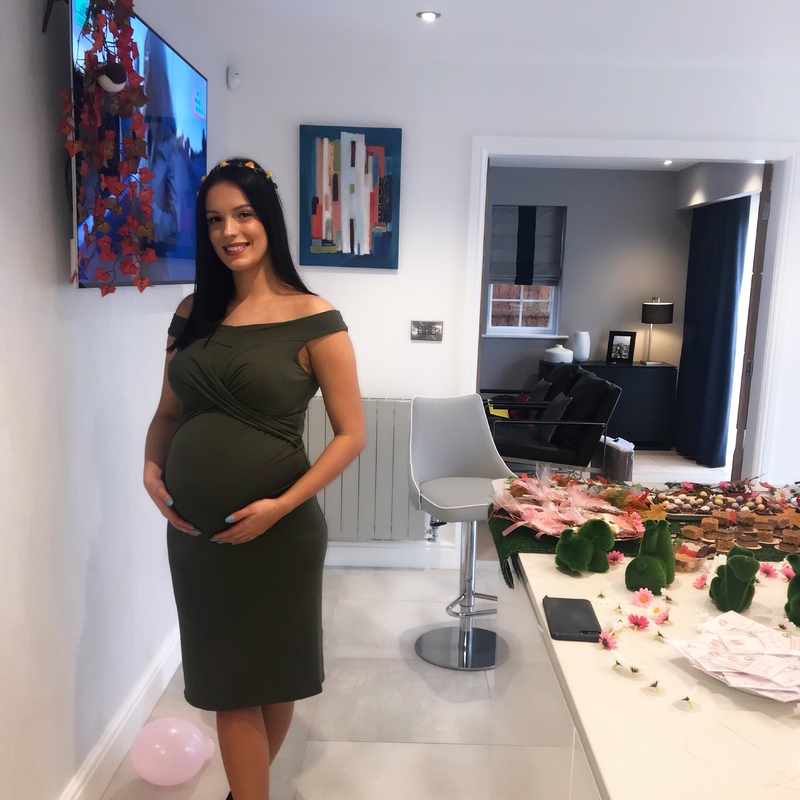 What is it like to be pregnant in your first trimester? 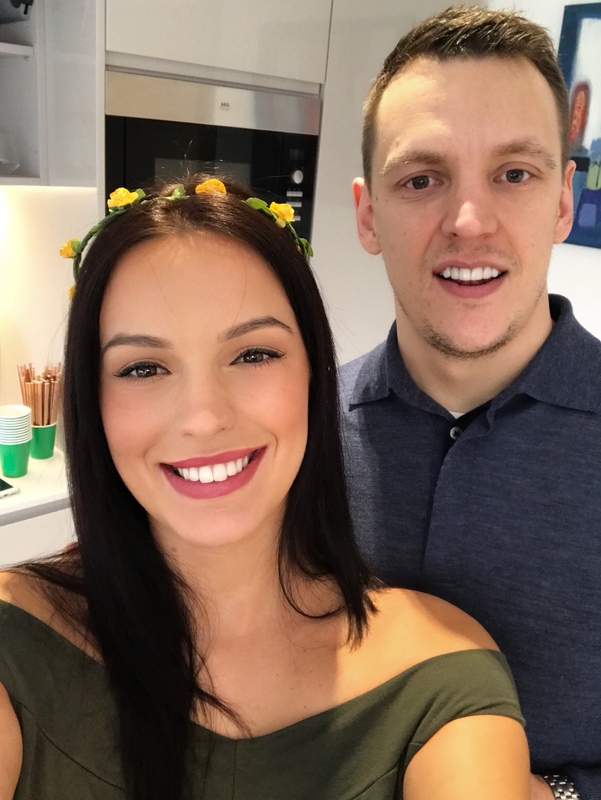 No Comments on What is it like to be pregnant in your first trimester? 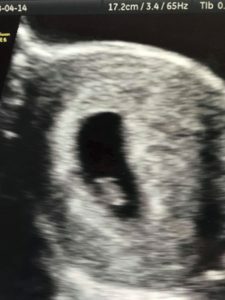 As it is #NationalBumpDay today it got me reminiscing my days when I lived as a whale, but more so, my first trimester. Especially as my symptoms were not the common ones. 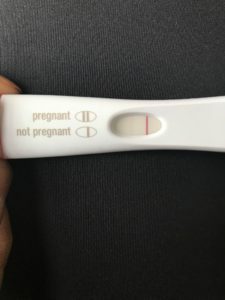 Before I found out I was pregnant, I had the feeling I kind of was as it is obvious there is a chance but, I just needed it really confirming to believe it as I had some symptoms but not all so this kept my thoughts in limbo. The first signs I got when pregnant was that I had cramping and twinges in my lower stomach, similar to period pain. 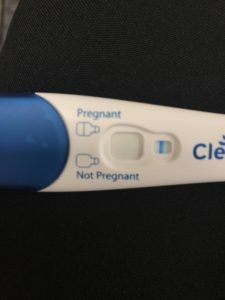 This is so hard when you are unsure because you have to wait till after your due period to take the test too so it felt like it could be that time of the month soon. Along with the cramping came the bloating. Again very similar to mensural symptoms. Nobody likes the feel of being bloated, its so uncomfortable. Nothing I was doing was helping the bloating go, such as drinking lot’s of water. I’m unsure whether I just was not hungry or I could not be bothered to make anything to eat. I really would try and avoid all meals, I never felt sick at all I just did not want to eat. This symptom came as a surprise as I believed that when you are pregnant all you want to do is eat! Urgh. 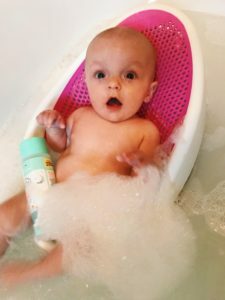 I have never, ever, until now having a 4 month old baby, experienced that level of tiredness before. i didn’t think it was humanly possible to be that tired! I like to think I am a very active person, well at that time, I went from going to the gym every single day, sometimes twice a day, obsessed much? To not being able to stand up whilst having a shower :’) I would get in from work and the first thing I would do would be to lie on my bed and then i’d sleep till the next day. I had ZERO energy! My sense of smell was stronger. I had noticed when I was spraying perfume or going in the kitchen and the smell of the fridge was very strong, to the point where I use to think, “What on earth is in that fridge?!”. By this point of my pregnancy, I became obsessively Googling, pregnancy symptoms to see if I had any similar and this was one that came up! I wonder how many other of you out there got a sense of smell like a Bloodhound?